One thing that never ceases to amaze us is how quickly this event comes around every year. 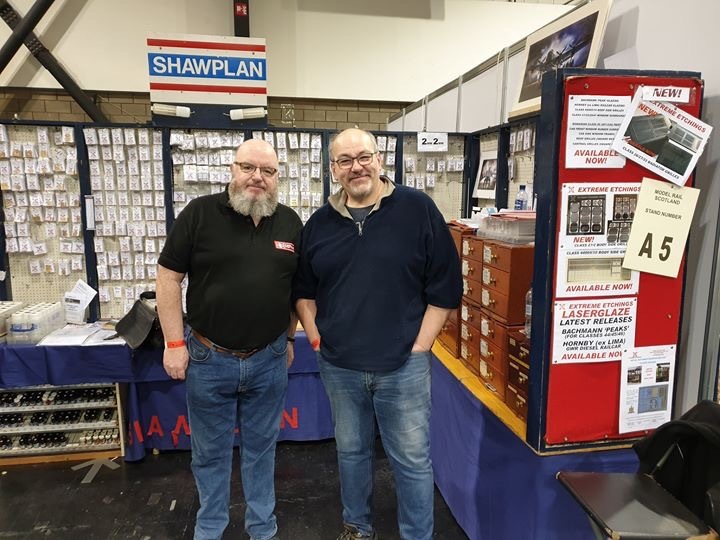 We have been attending this show for over 11 years now from our base in the midlands, 11 with the Shawplan stand. Although its a 3 day show, it becomes a 5 day event due to the traveling required to get to and from the venue. 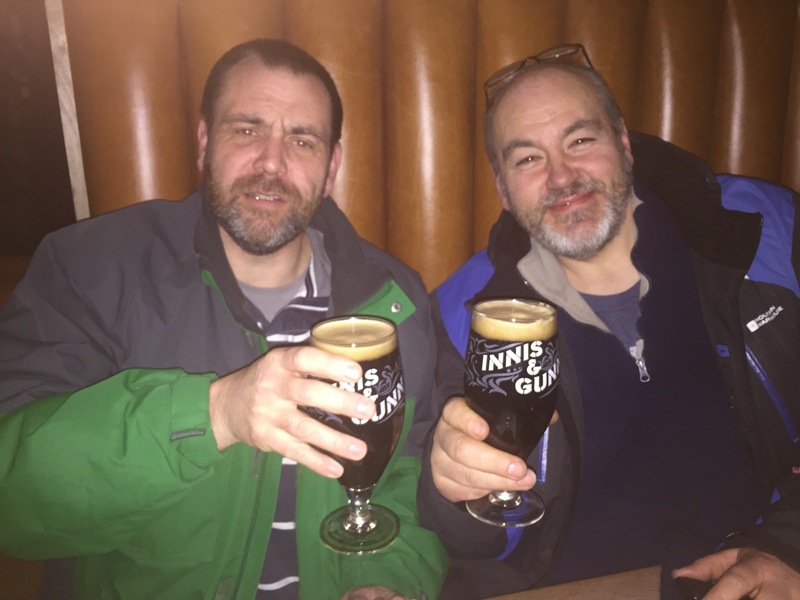 Our trip started out on the Thursday morning with Pete dropping his car off and Brian’s before we started on the road up the M1 and across the A66. Its a great run and the weather made it very pleasant. We were in contact with Bill who was traveling up from work in Coventry via the M6 and he was trying to catch us up. Our first pit stop was Southwaite services for a coffee and a burger. 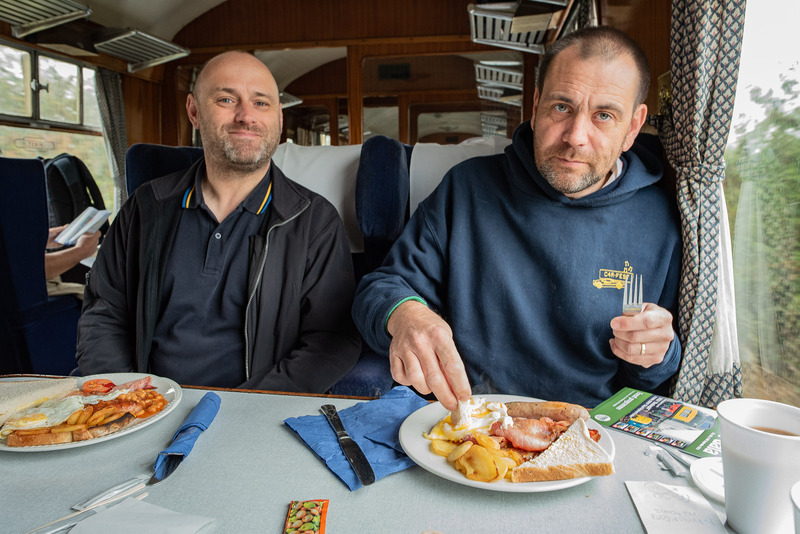 Pete was bemused that what he had ordered looked like half the size of Brian’s, which necessitated a top up with a Gregg’s sausage roll. A bag of doughnuts for the trip also found their way to the van somehow. Onwards then up the road and by the time we got to Hamilton Services Bill was with us. 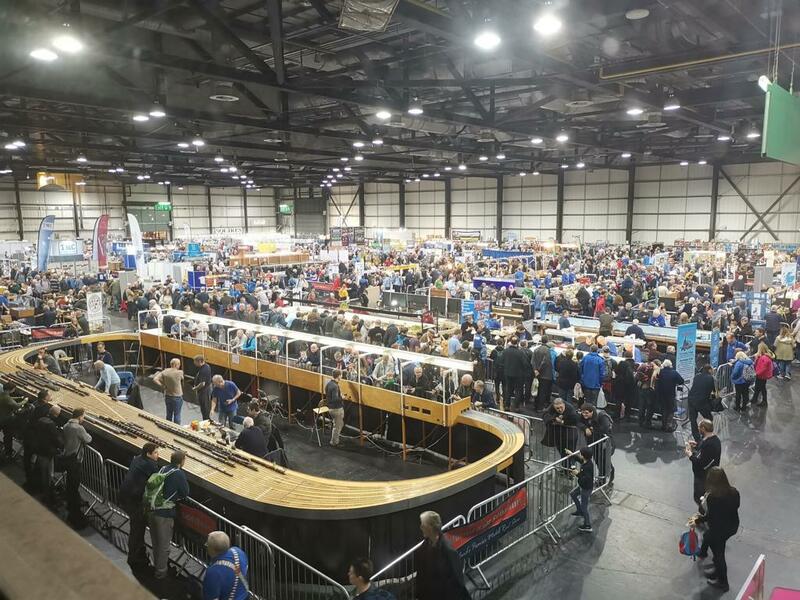 Our arrival at the SECC was later than usual but we got the van into the hall quickly and set up, shoehorning into the gap left for us by our neighbouring trader, who never noticed we had had to shove him back a bit. Once we were all set up it was a short walk over the Bells Bridge to the Premier Inn, our digs for the next few days. 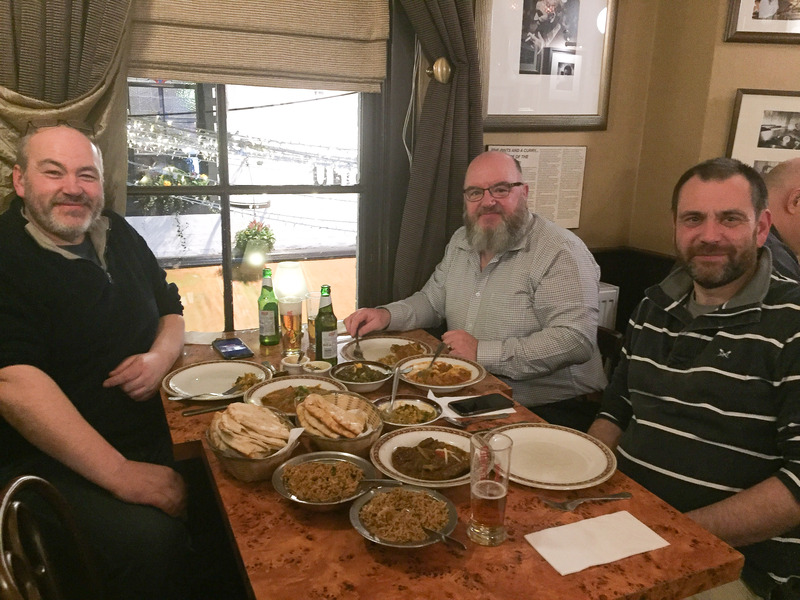 Soon it was time to get something to eat and as custom has it it was out to the Lord of The Isles at Braehead for Curry Night. The hotel offered to get us a taxi and when a Hackney rolled up I feared the worst regarding what the fare would be out to Renfrew. It turned out to be almost double the return fare using Braehead Taxis on the way back! 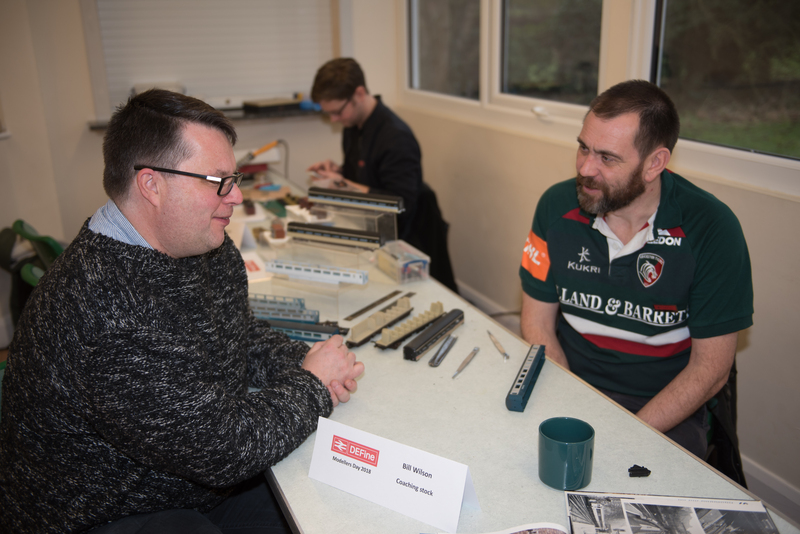 This year we were joined by James Hudson of Bill Hudson books. 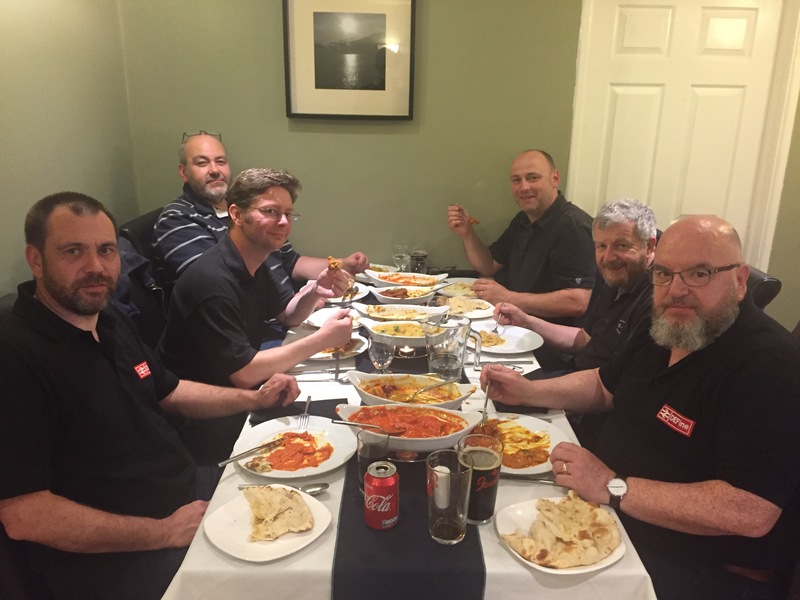 James is not one for curry so he played it safe, with the rest of us tucking in and taking on a few beers. Friday morning was an early start as the early entrants (or window lickers as they are affectionately known), were already starting to queue up to get in. 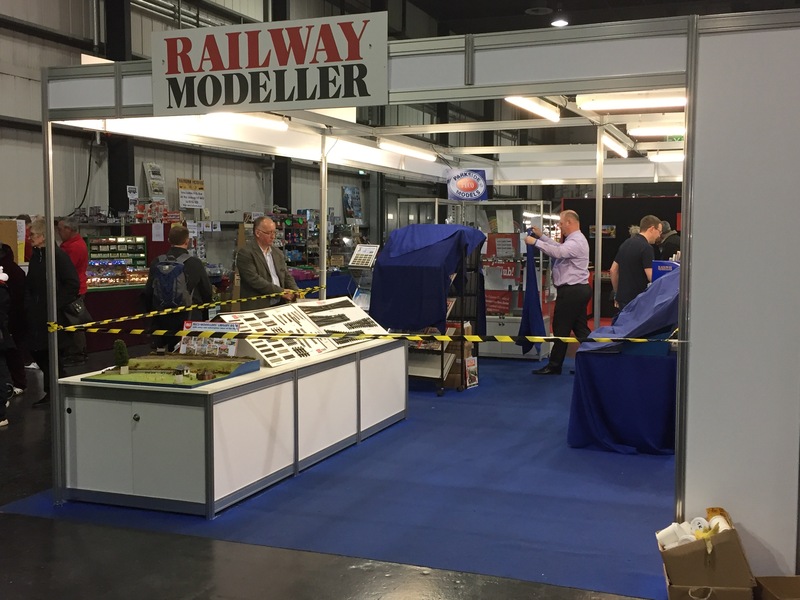 Friday is traditionally the modellers day when it comes to the type of visitor and the busiest on the stand. The venue quickly filled up and it was show-on! Calcutta Sidings 2 dominates the top corner of the hall. 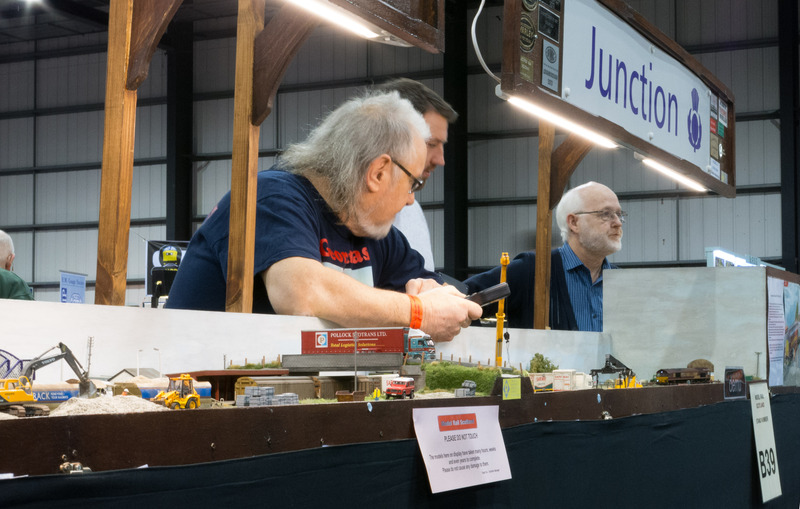 The standard of layout at the show is getting better with many now invited from across the country, including this year the mammoth that is “Calcutta Sidings 2”. There was one other celebrity layout in attendance at the other end of the scale but more of that later. 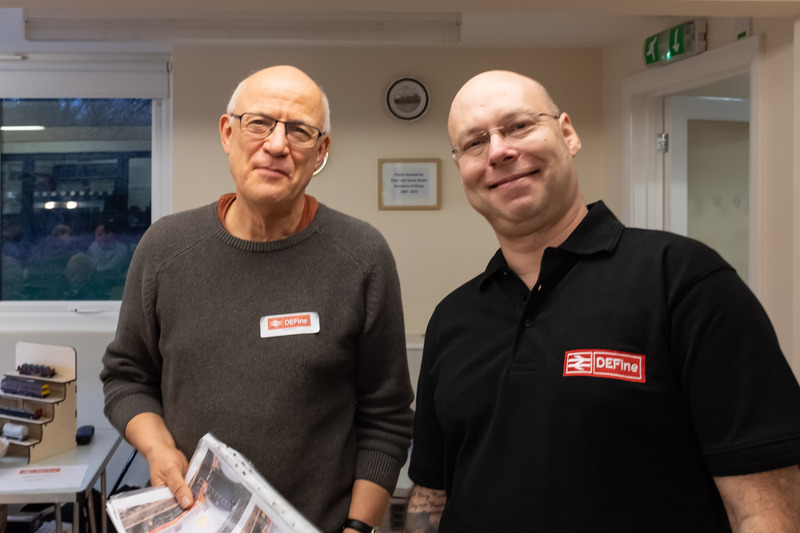 As Friday drew to a close Bill had to head back home as he had other business to attend to so after a quick freshen up Brian James and Pete headed out to the Panda Chinese buffet and a call in at the Old Toll Bar on the way back. 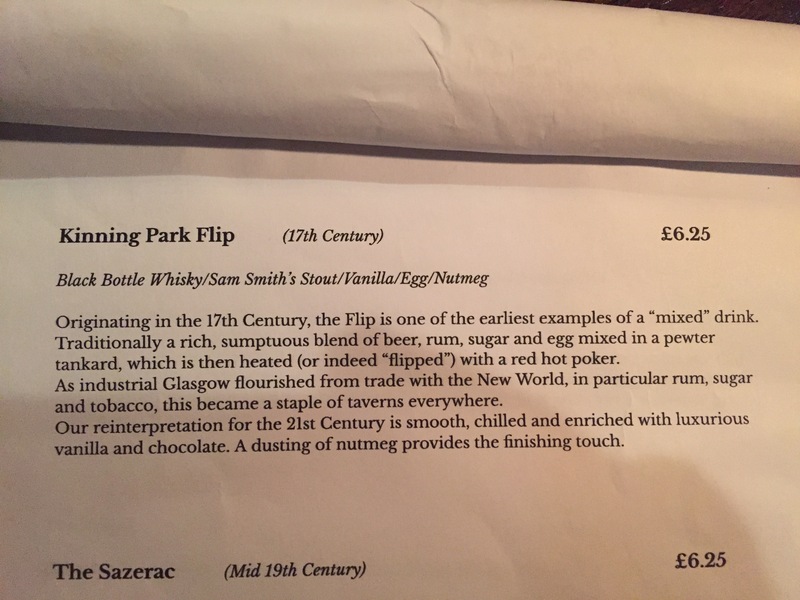 None of the group were tempted by the cocktails this year which included a “Peaky Blinders” selection. 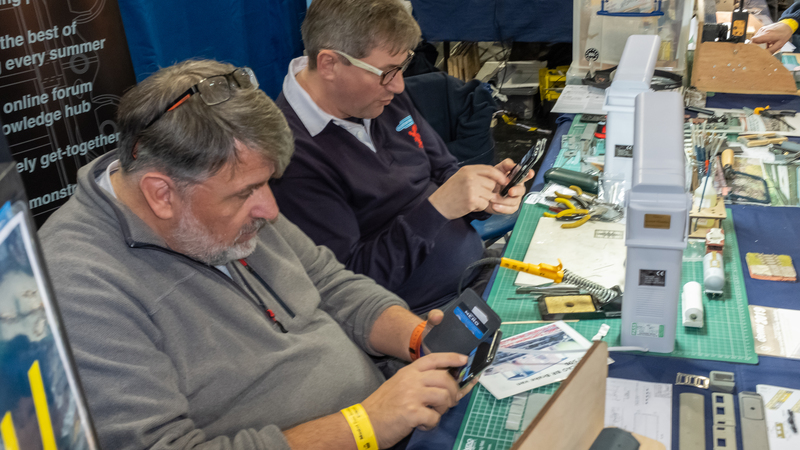 After breakfast on Saturday it was back to work at the show. 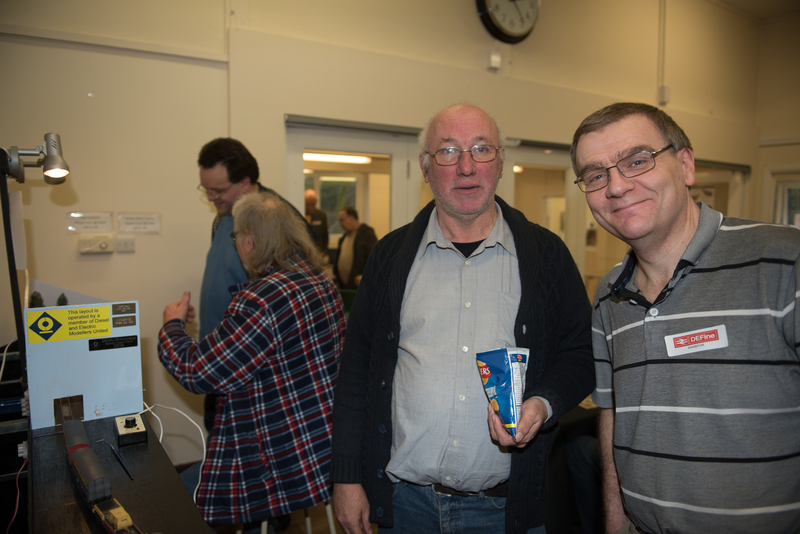 It was another busy day and lots of chatter and eating of Tunnocks products took place. We had to reign back on the eating though as Brian and Pete had lined up a meat-fest for that evening. With James deciding to stay at the hotel, Brian and Pete headed for Viva Brazil in the city centre. All you can eat meat and a very comprehensive salad bar awaited. No sooner were we seated we were presented with the first of many meats to try. In the end Brian tried about 16 meat offerings and I had about 13. Absolutely stuffed we headed out into the mild evening weather for a cultural tour of the city centre with Pete as the guide. One thing that really disappointed us was the mess they are making of the new look Queen Street station. Having exposed the full splendor of the southern glazed arch they are now proceeding to hide it again with some monstrosity of a building, sacrilege. 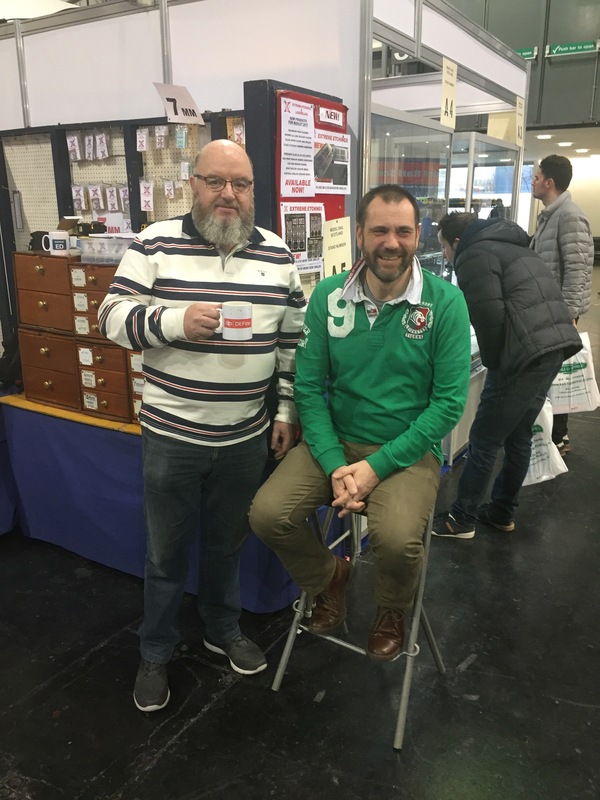 Sunday as expected was a quiet day which gave us a chance to see a bit of the show and for Brian to spend a bit more time liaising with other traders and manufacturers. By the end of the day we were ready to pack up and once the van was in the hall it was time to load up and get back to the hotel. Due to being a bit knackered we decided to eat in the hotel on the Sunday night, and had a nice meal. 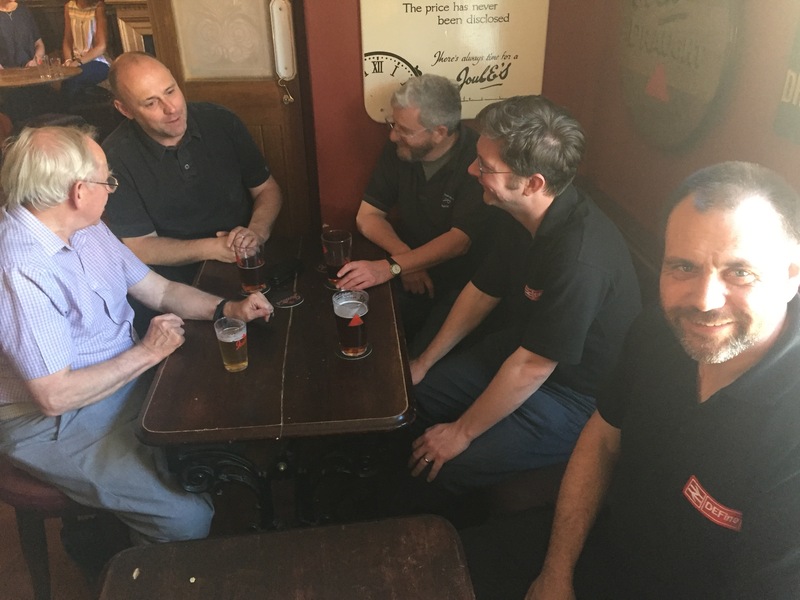 Before that we joined the RevolutioN and Accurascale guys for a bit of banter in the hotel bar. We had a few laughs and it was a nice way to finish off the weekend. And so in line with tradition we award the DEFine $hite Modelling award (just a bit of fun). 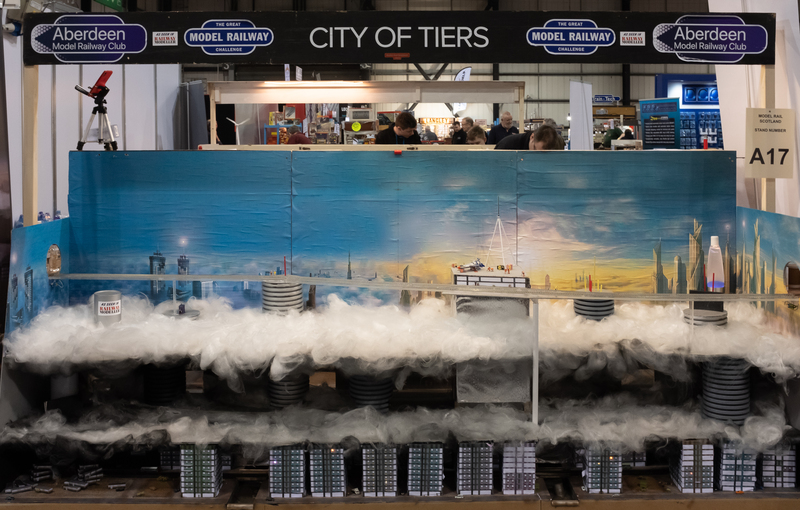 This year it goes to none other than the celebrity layout by Aberdeen Model Railway Group that won the “Great Model Railway Challenge” on TV, “City of Tiers” (Or is it City of Tears?). 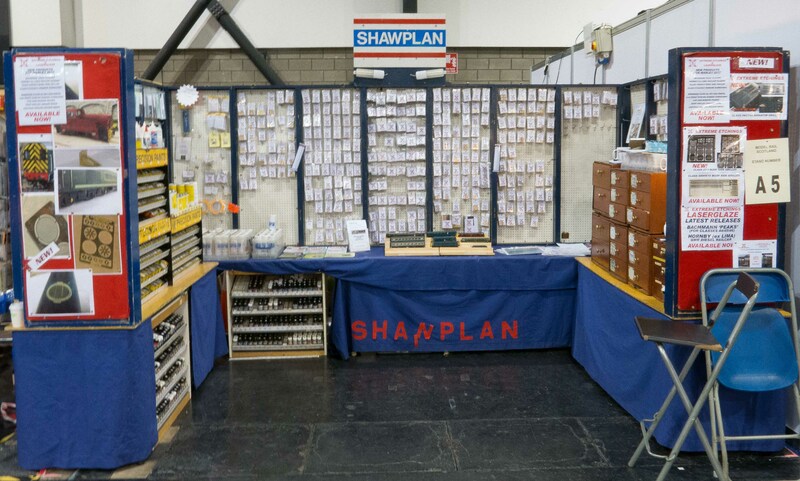 Unfortunately the Shawplan stand was opposite this and we had to look at it for 3 days. 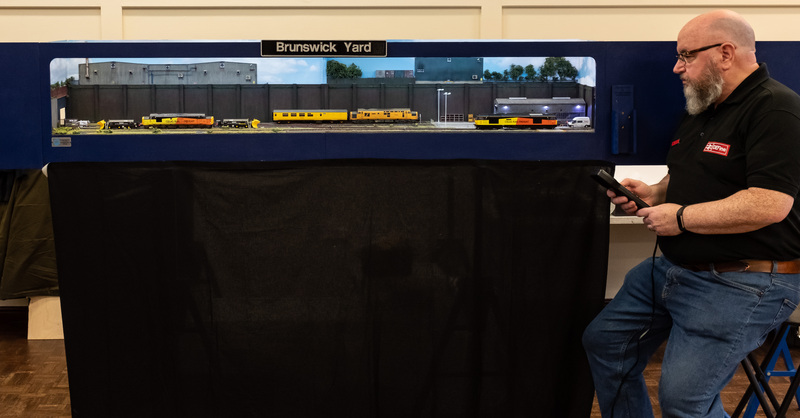 OK, it was built in 3 days and it was TV entertainment but it doesnt represent railway modelling in its true form. 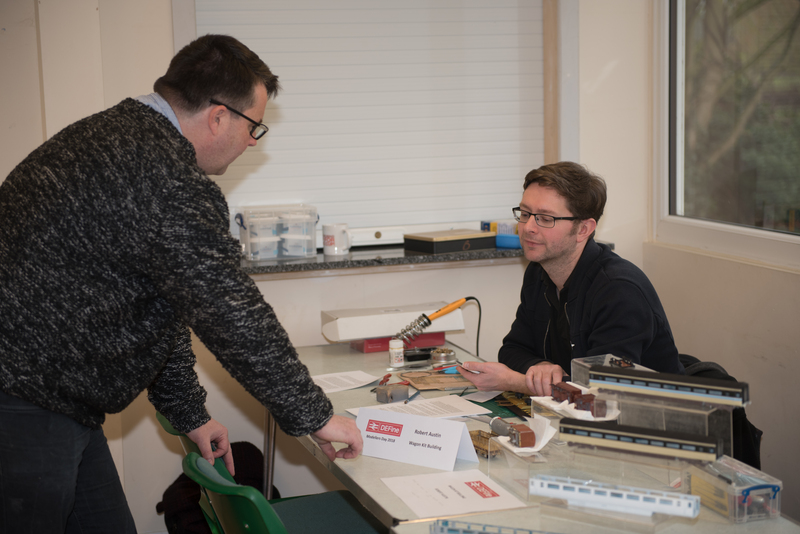 It does for railway modelling what Charles Ratner did for the jewellery business. Who has been feeding Clive the blue smarties again? 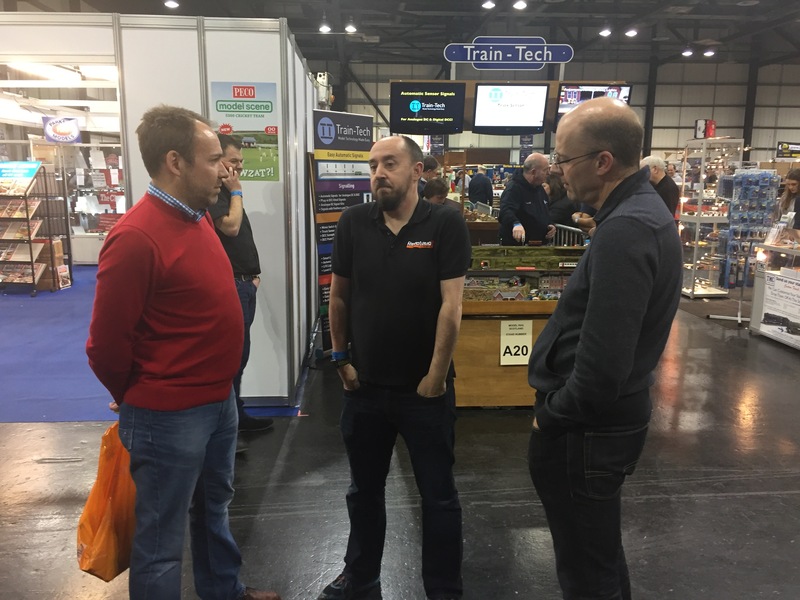 Brian and Terry ponder the merits of Peco Setrack, is there a change coming? 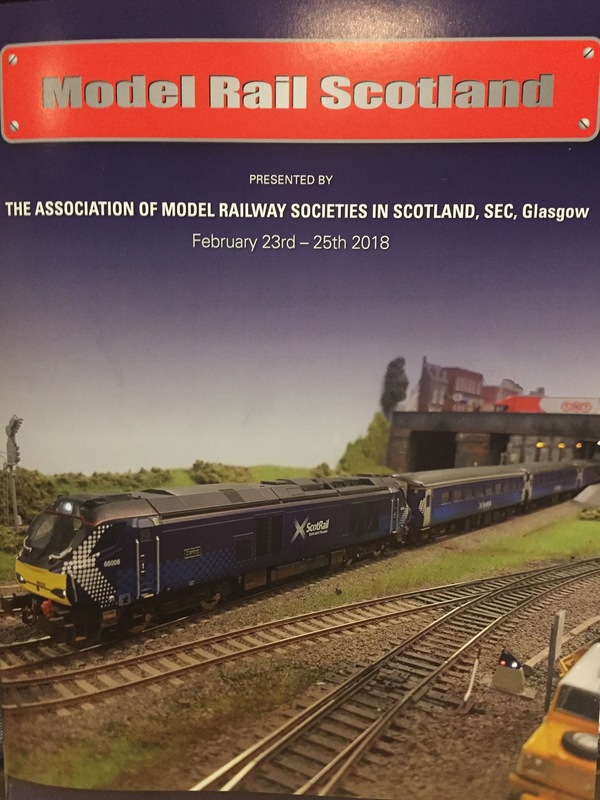 Having decided that DEFine Modellers Day #3, would go ahead early last year its incredible how quickly it comes around. 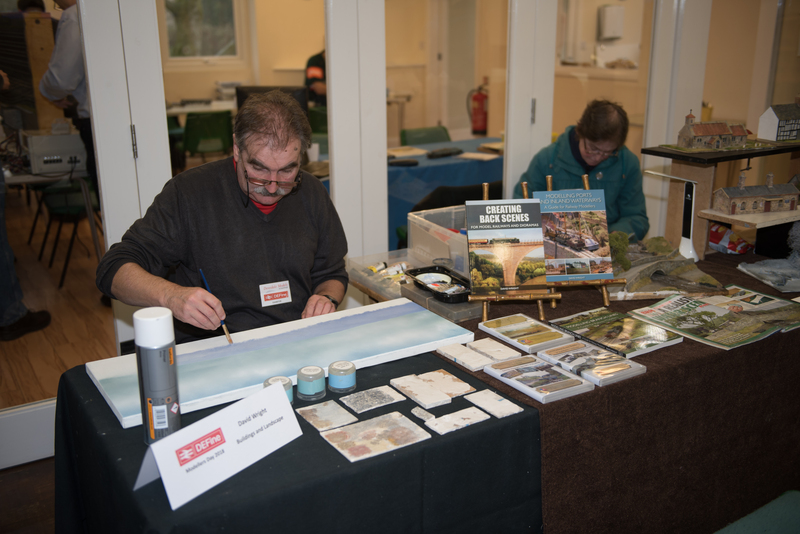 With all the planning done it was soon time for the event to take place. The week before involved a lot of work in the background sorting out insurance, signage and of course getting all the refreshments purchased. And so to the day itself. 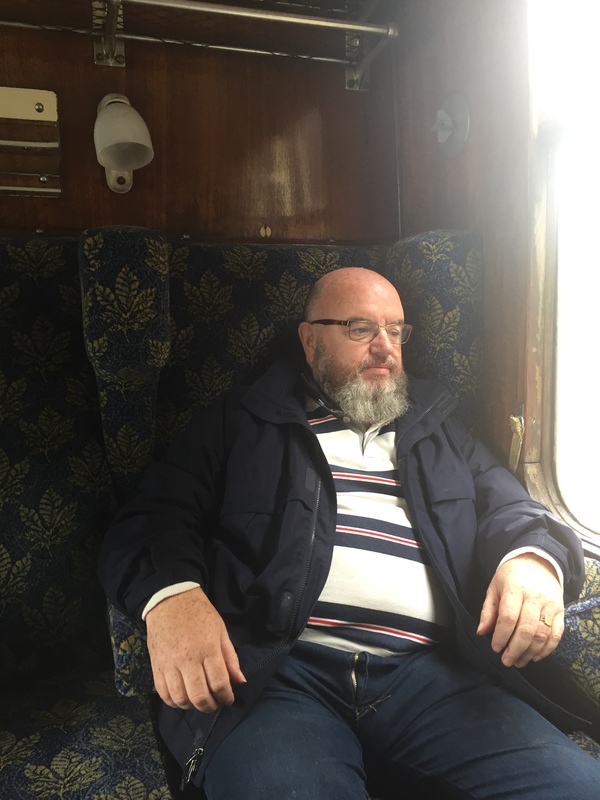 It was an early start for the team with Bertie having to travel from Mansfield to open the hall and get the tea urns fired up. 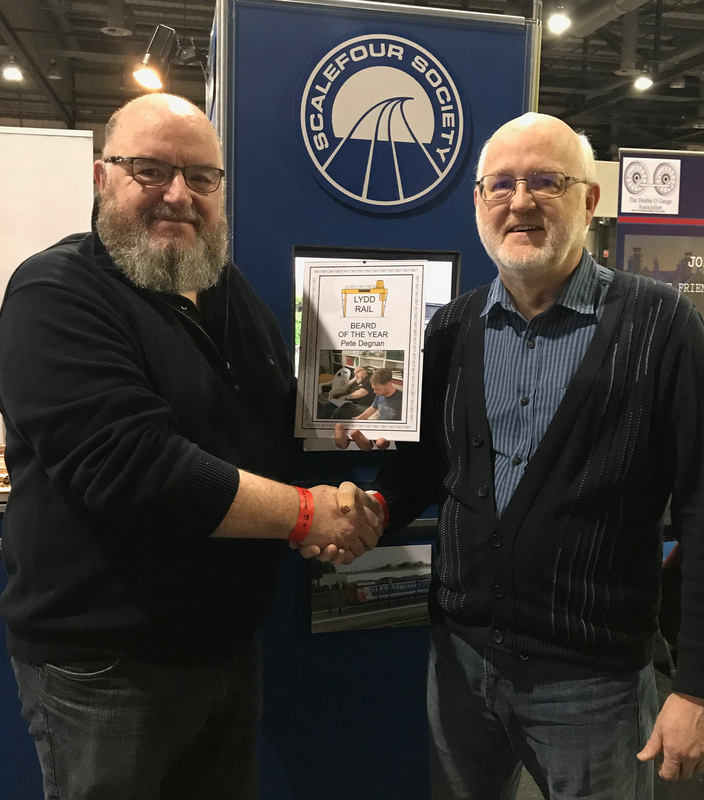 Bill had agreed to head up the A1 to help Paul Marshall-Potter get “Shelfie2” to the event and Paul was assisting Pete in getting “Brunswick Yard” over to the venue. 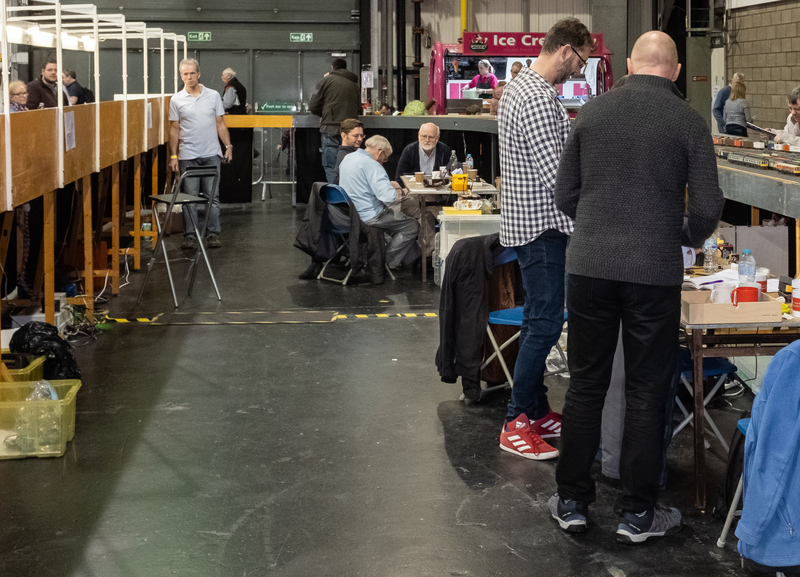 No sooner had the hall opened for exhibitors, it soon started filling up with layouts and demo tables. 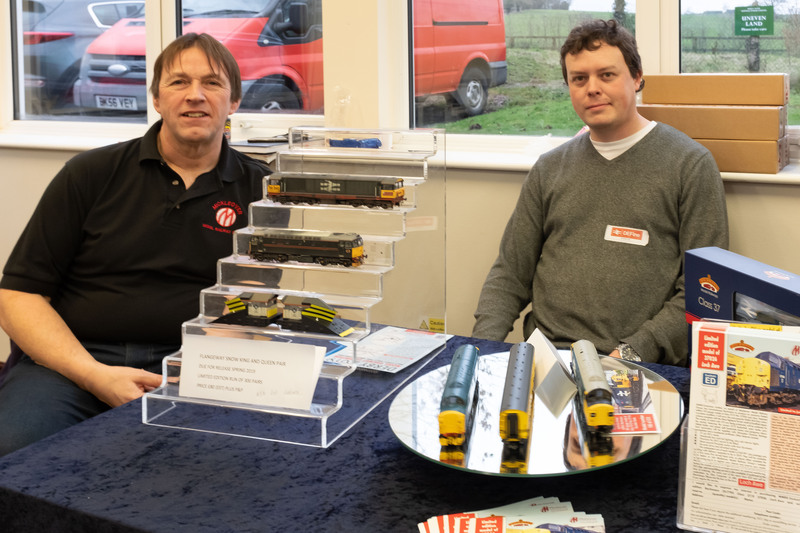 We had a wide range of demos this year mainly stock based, with examples of coaches, wagons, weathered locos and on-track plant. 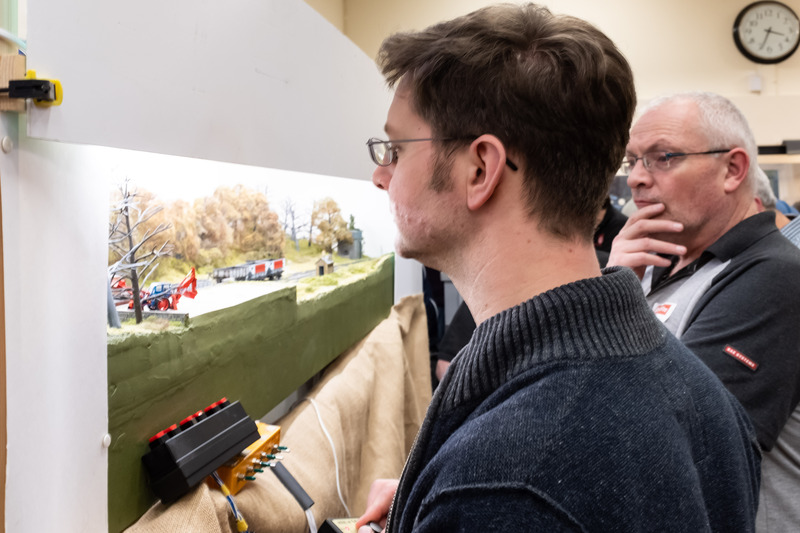 Each of the demos, as in previous years, were busy all day. 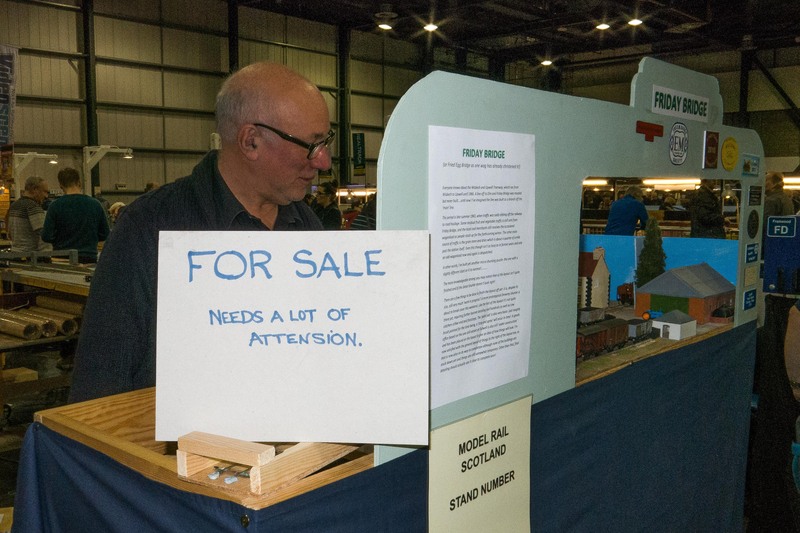 We had 6 layouts at the event, 7 if you count the small shunting plank that Mike Whitchurch had brought over from Spain in a suitcase! By 10am we were ready and had people waiting to come in which is always a good sign. The attendance was similar to previous years and by lunchtime there was a healthy throng within the hall. 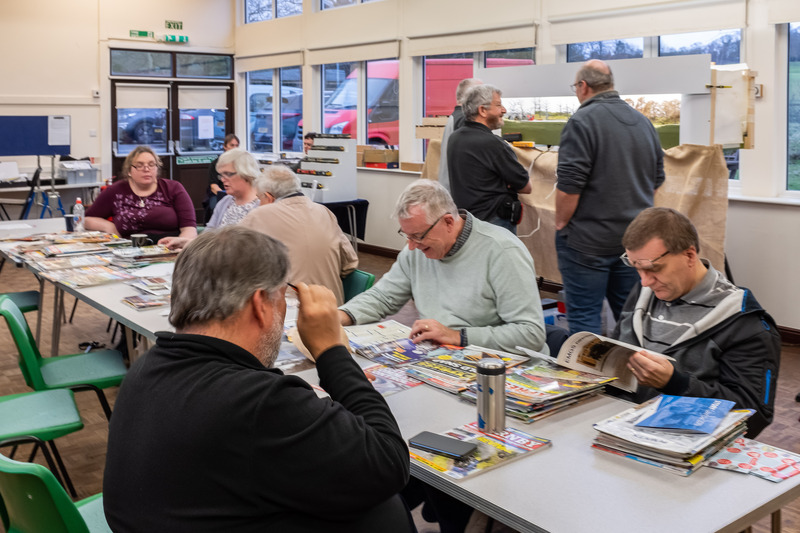 Many people took advantage of our “Social Zone” to just sit and chat and help themselves to the piles of free magazines. 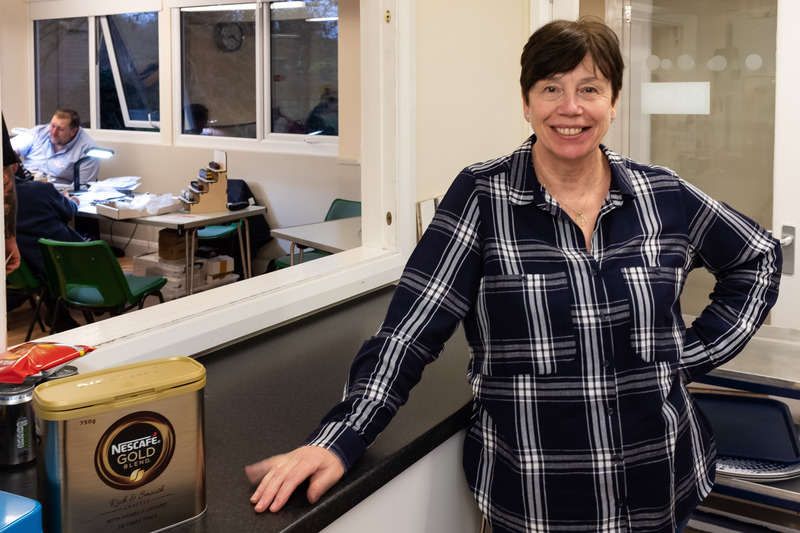 The kitchen was doing a roaring trade all day in tea and coffee with a selection of pastries and filled rolls on offer served up by Sylvia. 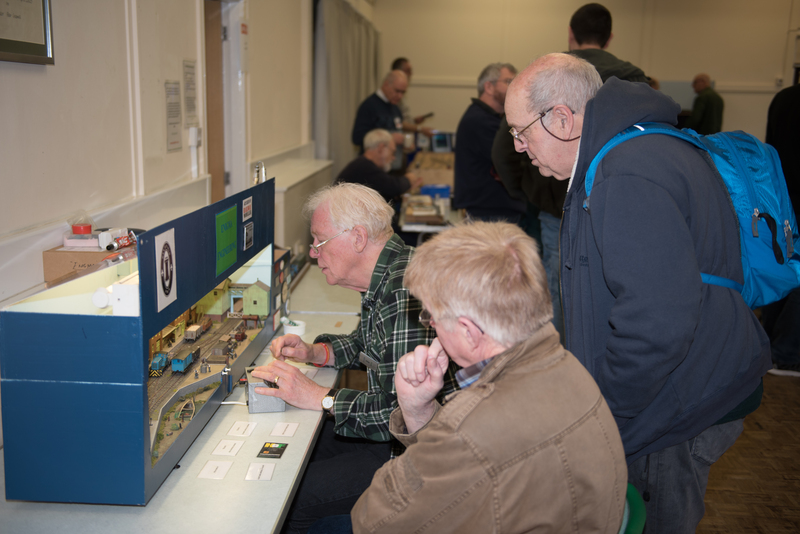 We received many comments about the quality of the layouts in attendance. 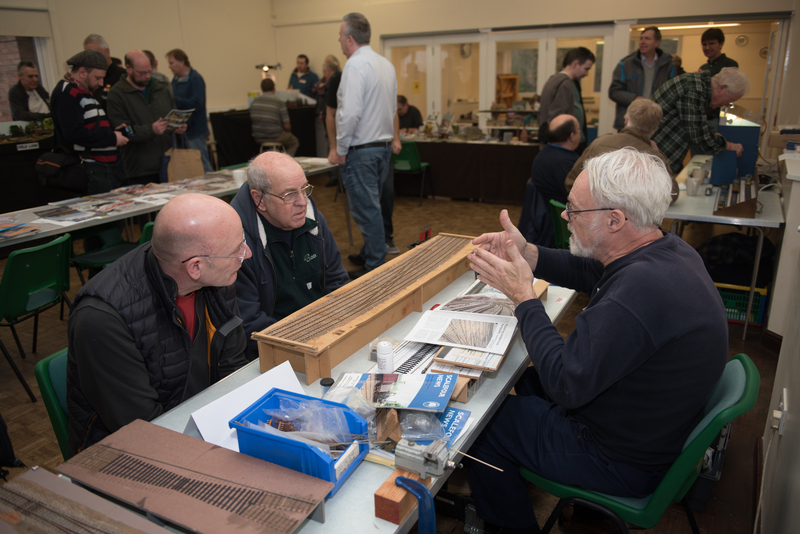 Our first 2mm layout at the event “Sutton St Annes” seemed to be a hit with even the 4mm modelers. 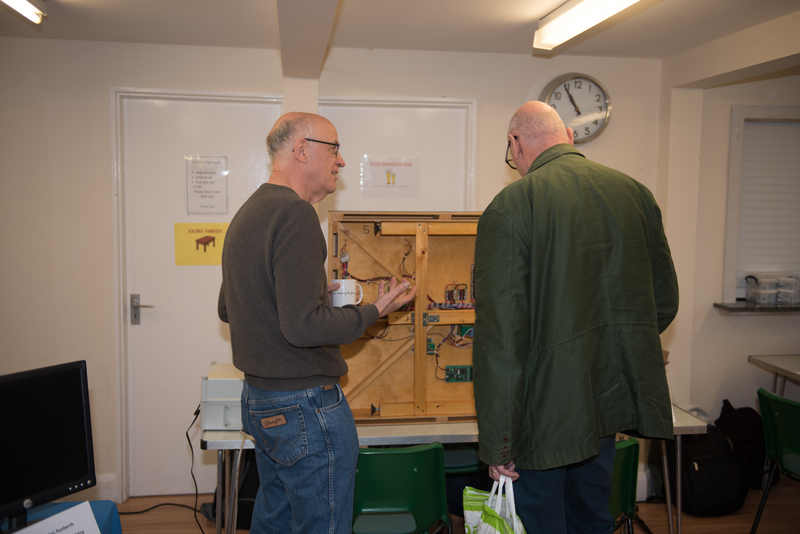 The P4 gauge masterpiece that is Howard Bolton’s “Minories” was a big draw and had a healthy audience all day. 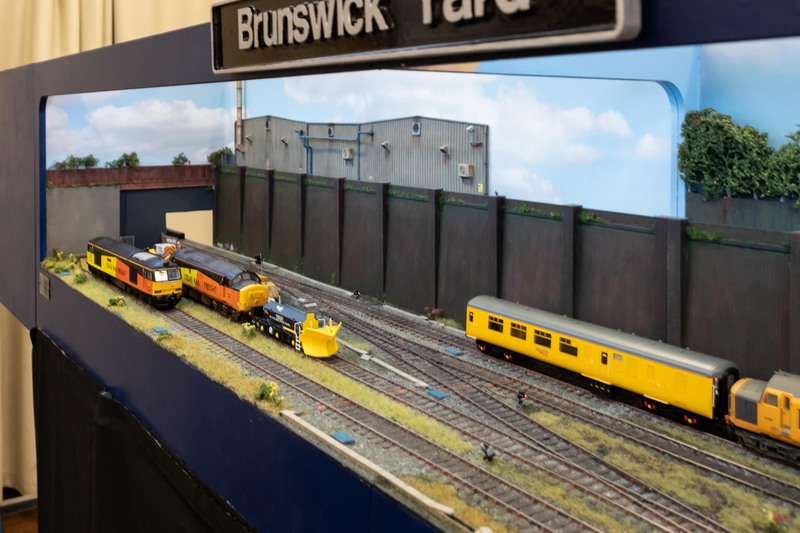 It was the first outing for Pete’s “Brunswick Yard” with fiddle yards fitted and all went to plan. 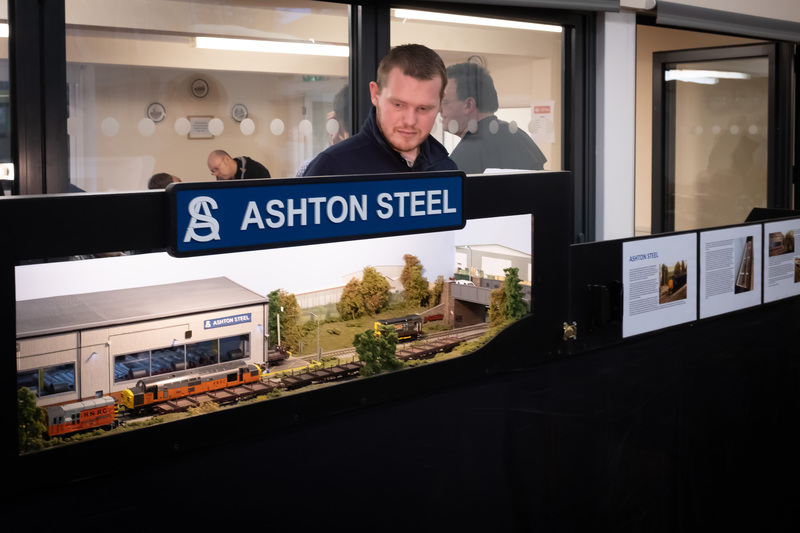 It was obvious from the interest being shown throughout the day that “Shelfie2”, “Caradon Junction” and “Ashton Steel” were all equally entertaining our guests and feedback on the layout selection was very positive. 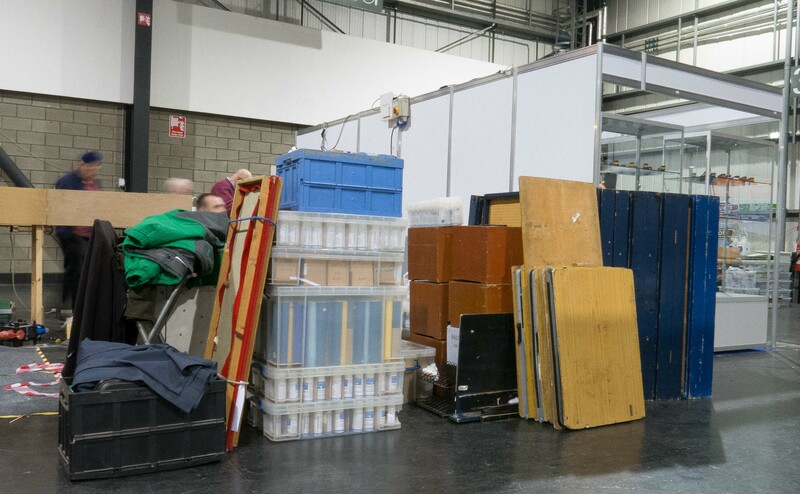 As in previous years it seemed that no sooner had we let the first visitors in, we were starting to get ready to pack up. The day seems to fly by and there is never enough time to spend chatting with all the friends that come to support us. Again, as in previous years, we still had a good number of people in the hall, many of who had visited for the whole day. The DEFine team would like to thank everyone who turned up for their support and hopefully we break even and can do it all again next year. That’s better! 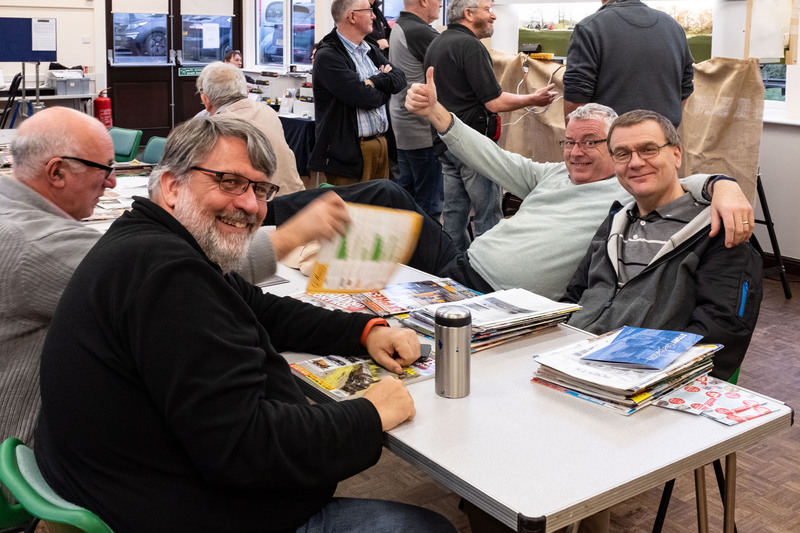 Nobby, Richard and Mike share a laugh whilst Clive reaches for more reading material. 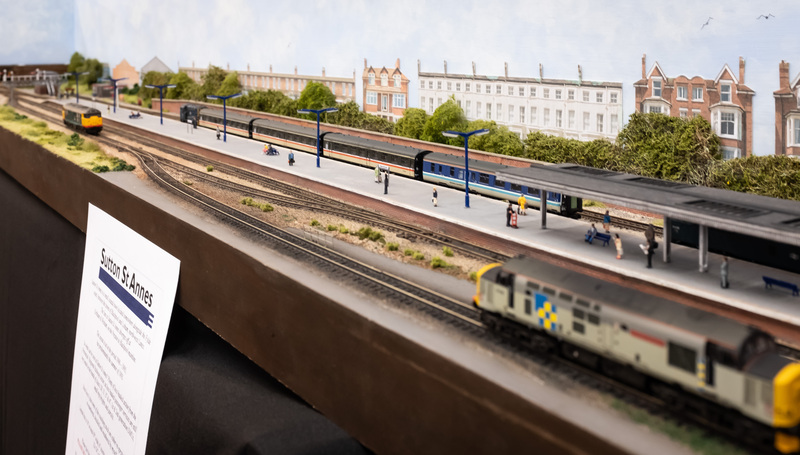 “Sutton St Annes” drew a lot of interest at the event and is a great example of 2mm modelling. 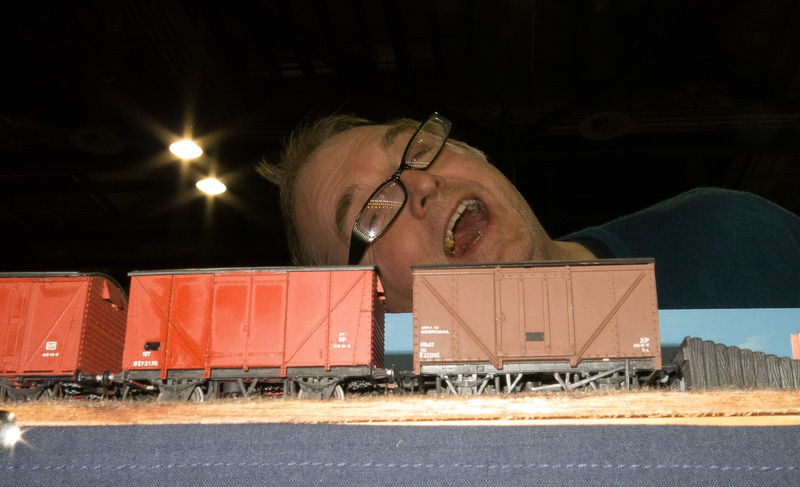 Bill takes a break from P4 and tries the smaller gauge for size. GQS in 2mm anyone? Bertie takes the helm of “Shelfie2” whilst a worried PMP looks on. 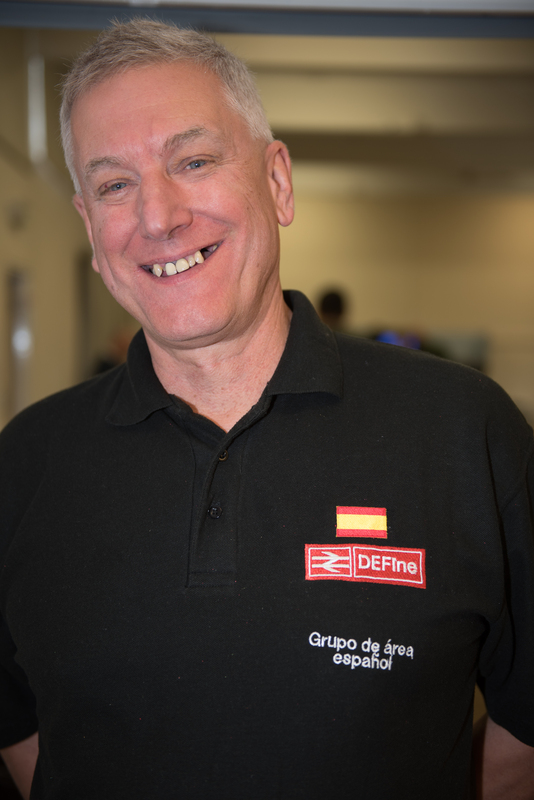 It’s a few months since we reported any activity from the DEFine team but things have been moving along well with all our personal projects. 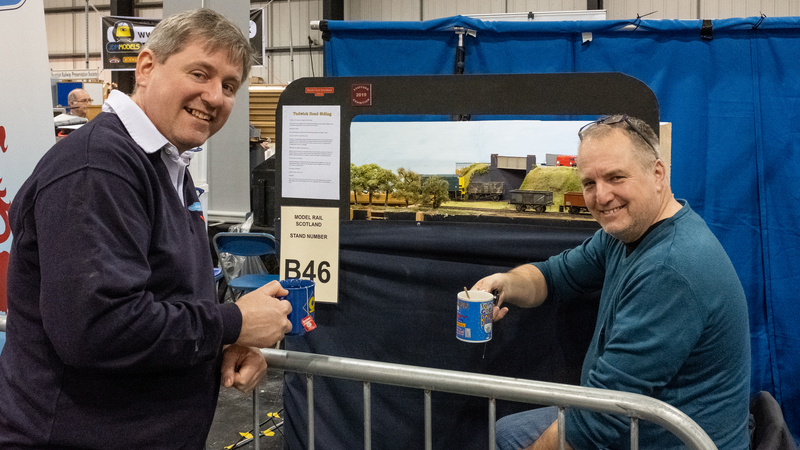 We still meet once a week and busy ourselves with some modelling, chatting, eating biscuits and drinking coffee/tea. 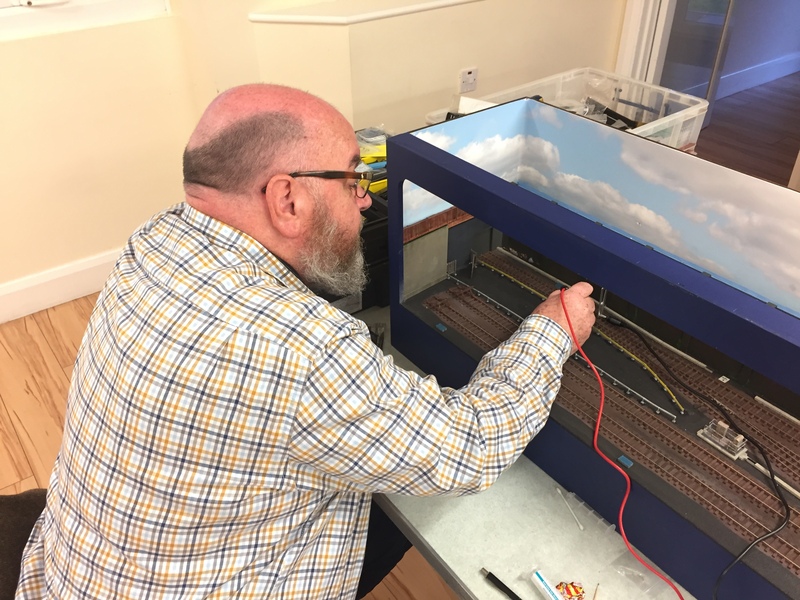 For the past few years Bill has been working on creating a P4 gauge model of Glasgow Queen Street. 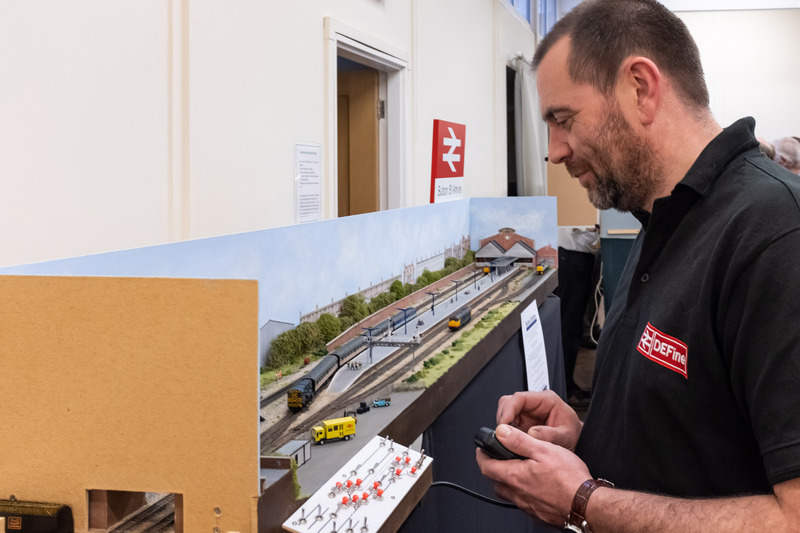 Lots of research has gone into it and here we see Bill working on the board that hosts the track work from the tunnel and into the station throat, fanning out into platforms. 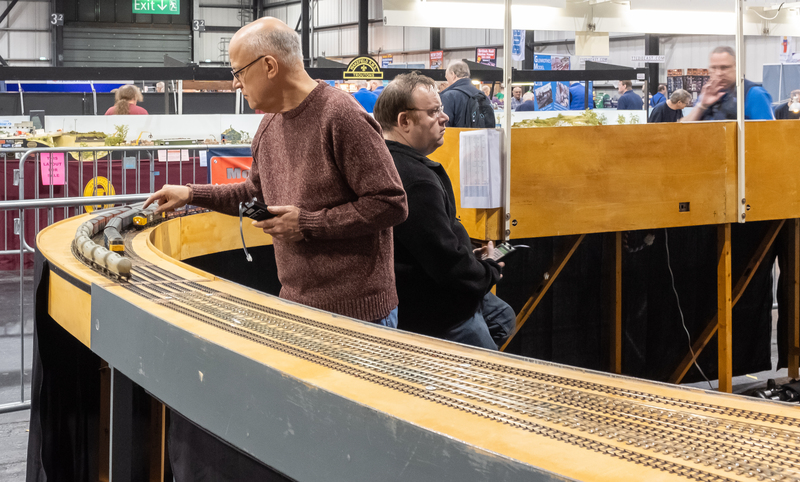 All the track on both boards is hand-built and Bill is currently completing the DCC wiring. 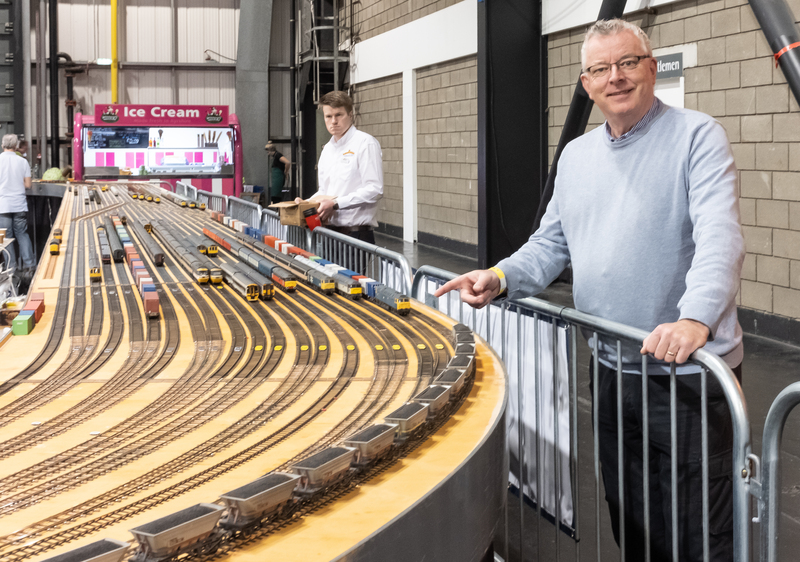 Bertie is currently building a layout (40ft) based on Shirebrook, also in P4. 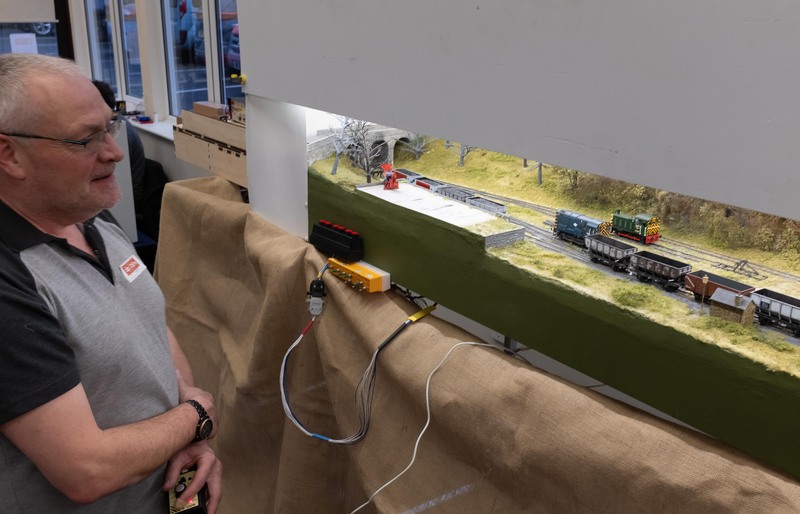 When not working on track Bertie spends a lot of time working on stock, mostly improving kits and RTR stock with improved suspension, braking details and other such work to help improve the look of the models and also improve the running capabilities. 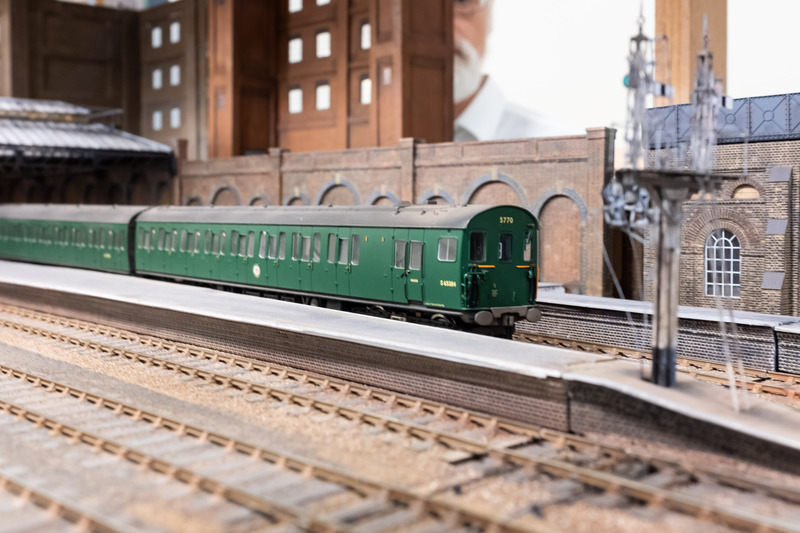 Bertie is a fan of the Rumney Models replacement chassis approach and has done quite a few. 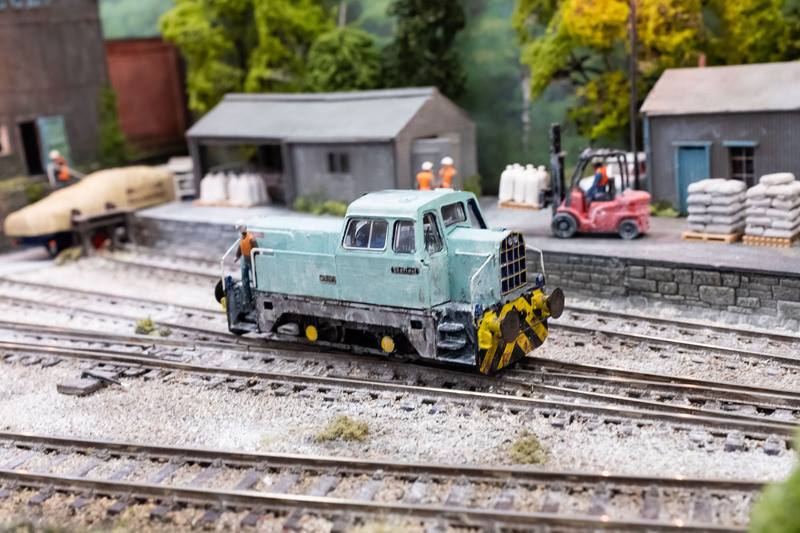 Here he is working on a 16t Mineral Wagon. 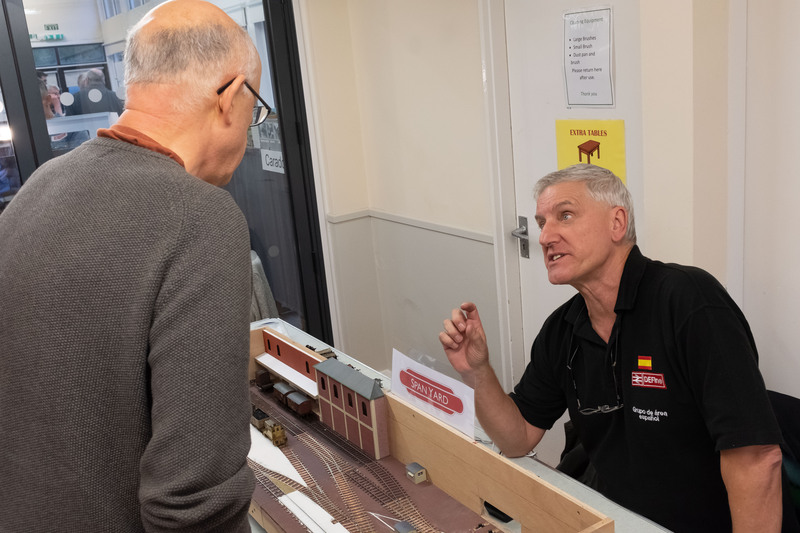 Brian has a long time ambition to build a model of Kings Cross but running a business for modellers and supporting Ready To Run manufacturers often gets in the way. In the meantime he turns his attention to improving stock. 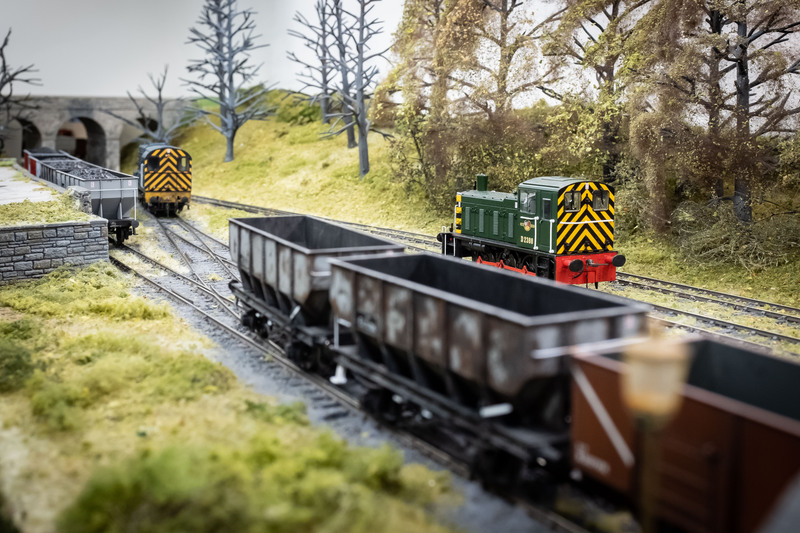 Like others in the group he has built replacement chassis’s for his locos using the Penbits suspension kits. 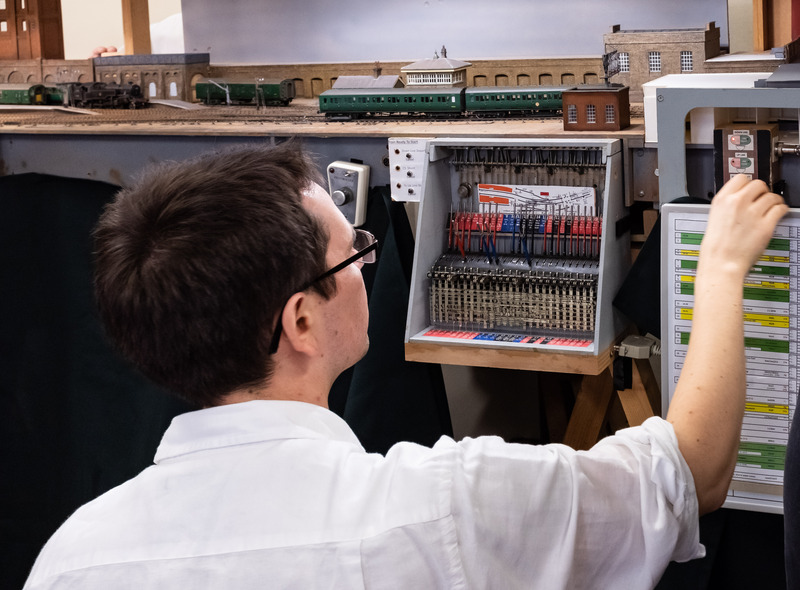 Brian can be seen here working on his latest conversion, a Class 47. 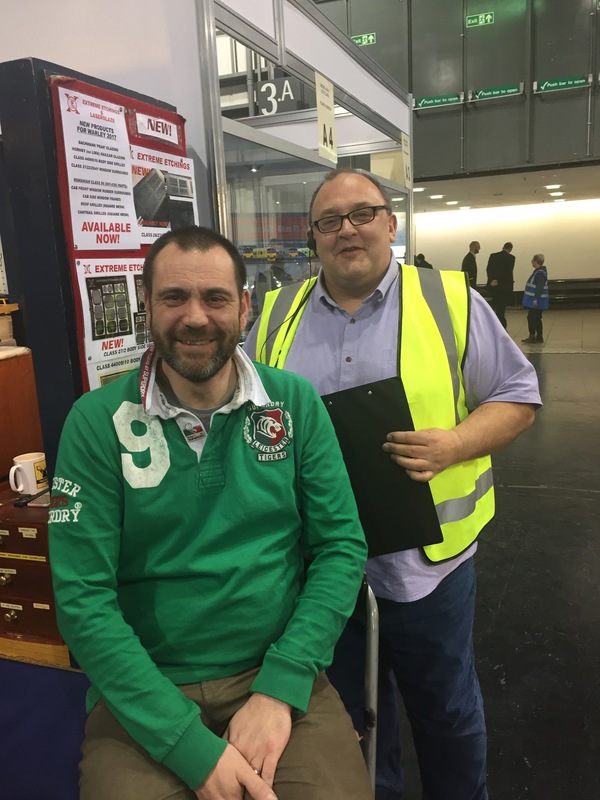 Paul (left) is also working on some wagon stock improvements. 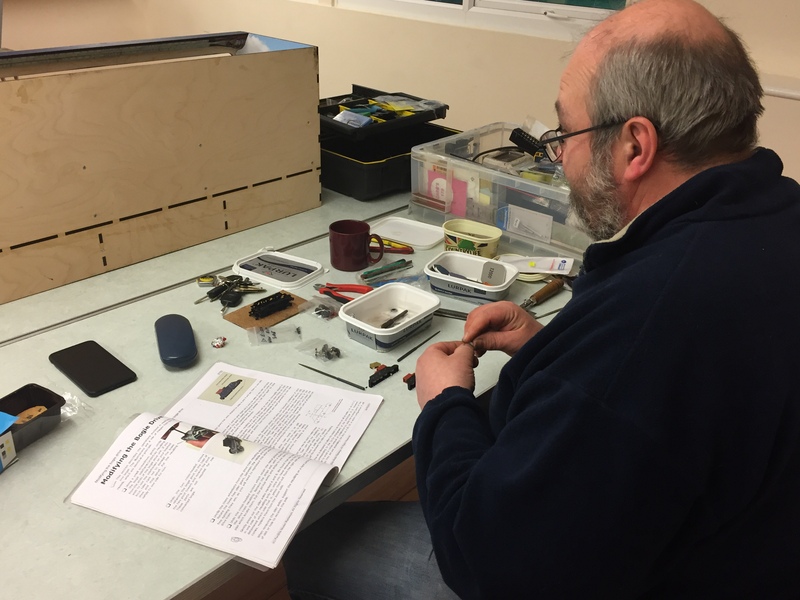 As well as designing parts for his own stock improvements, Paul is in the final stages with his excellent P4 layout “Splot”. 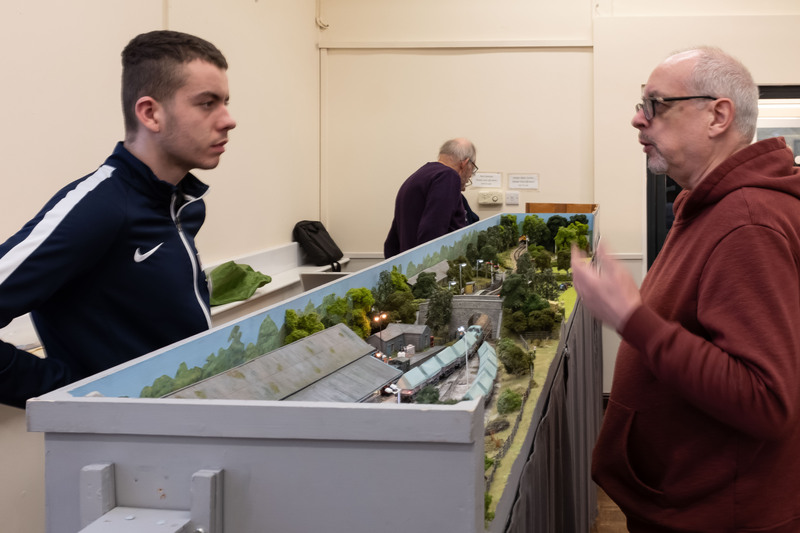 Here he is working on some bogie parts for “Powell-Duffryn” steel carrier wagons, ably assisted by Dave. 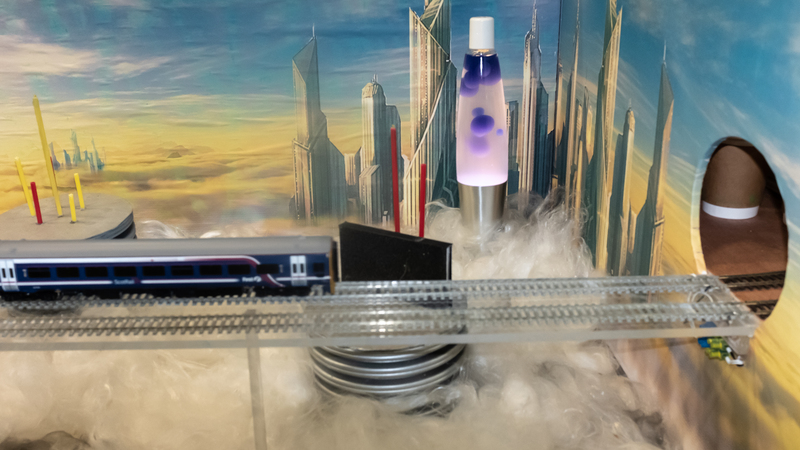 Once completed these will be unique items and will join the many other pieces of bespoke rolling stock that Paul has built. 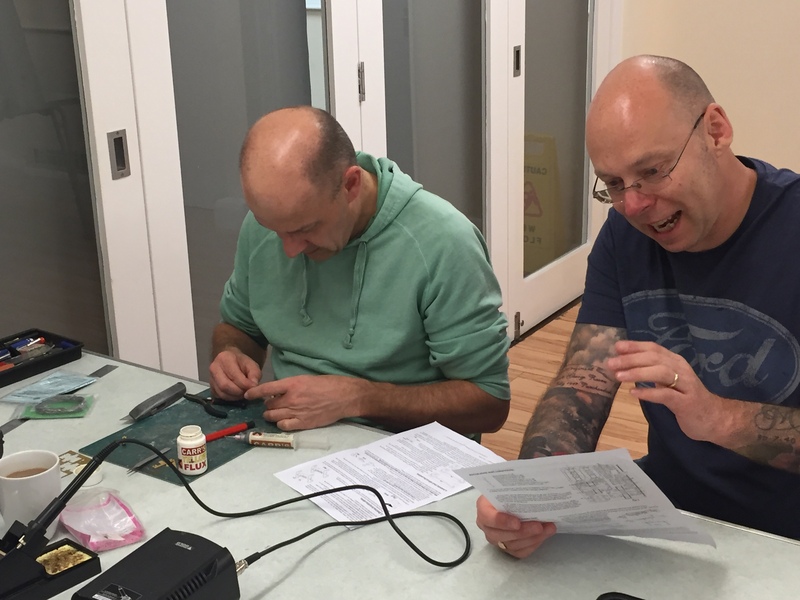 Dave (right in previous picture), has been very busy recently. 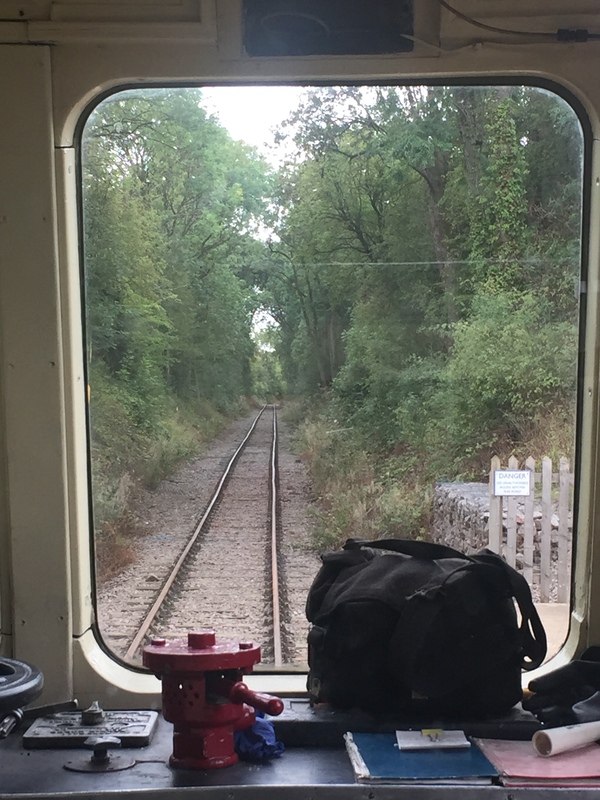 He is still working on his recent layout “Underhill Road”, whilst at the same time working on writing magazine articles. 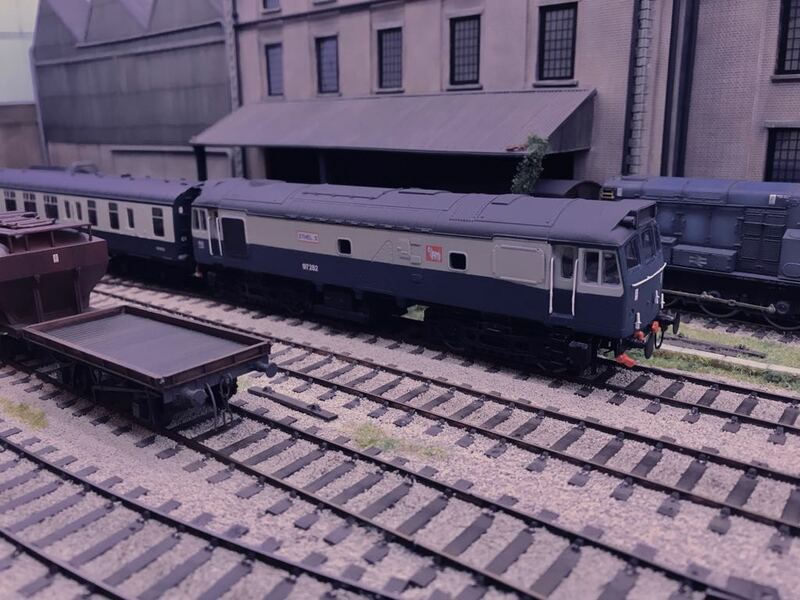 The June Model railway Journal contains his detailed article on modifying and improving RTR Class 25 locos. 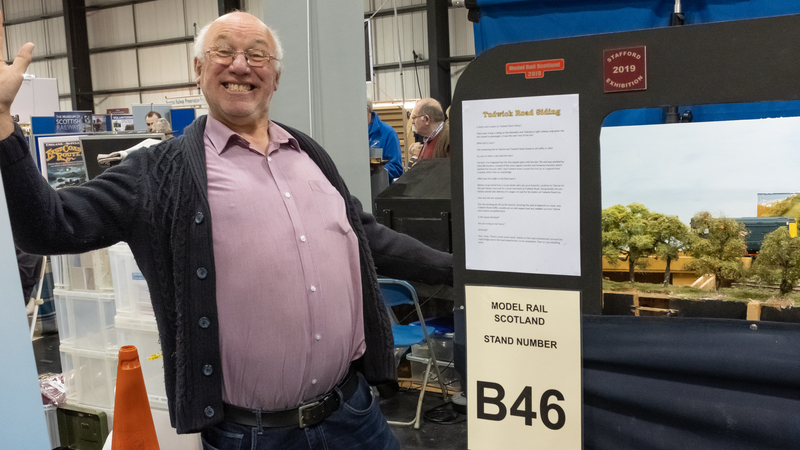 He has also recently built an “ETHEL” train heating loco in P4 ( seen above ) for Bill to be used on his Glasgow Queen Street model. 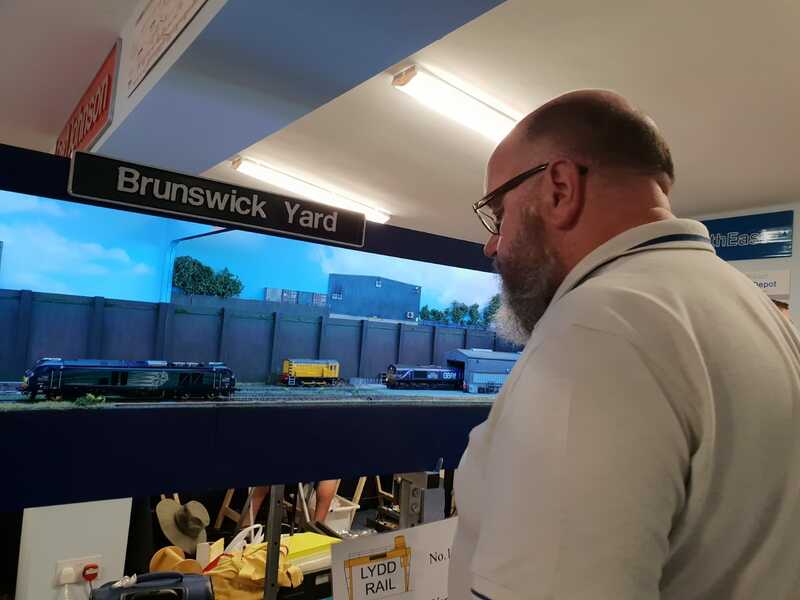 Completing the line up is Pete who is seen here working on his latest P4 layout “Brunswick Yard”. 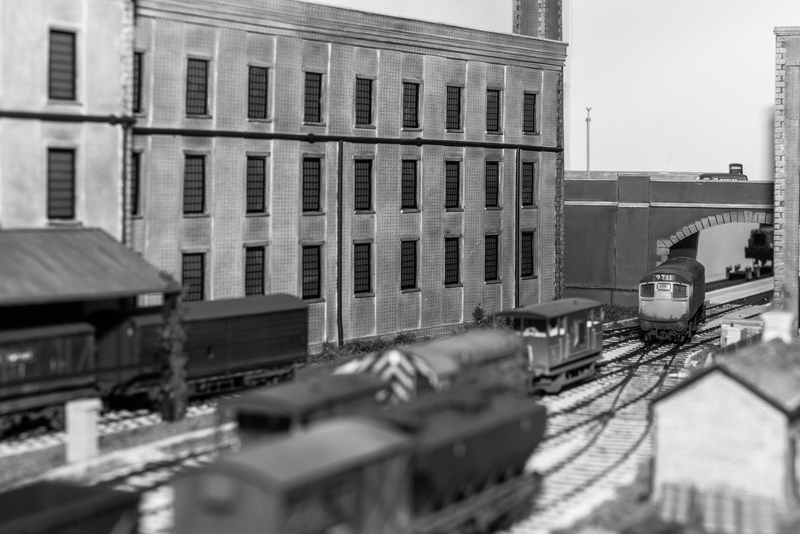 It is a fictitious location built on Tim Horn baseboards with a 6ft scenic section and two fiddle yards. 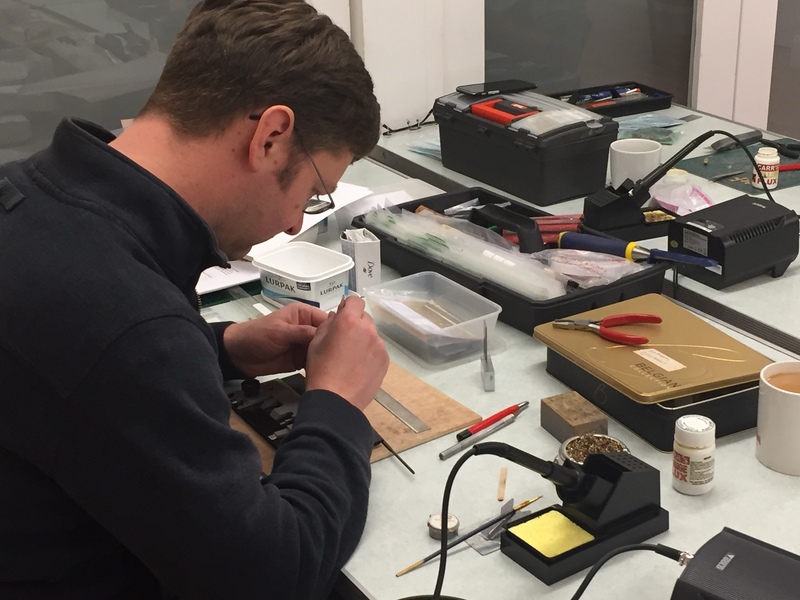 Pete is seen here negotiating the construction of stretcher bars on to the point work using the group’s Resistance Soldering Unit (RSU). 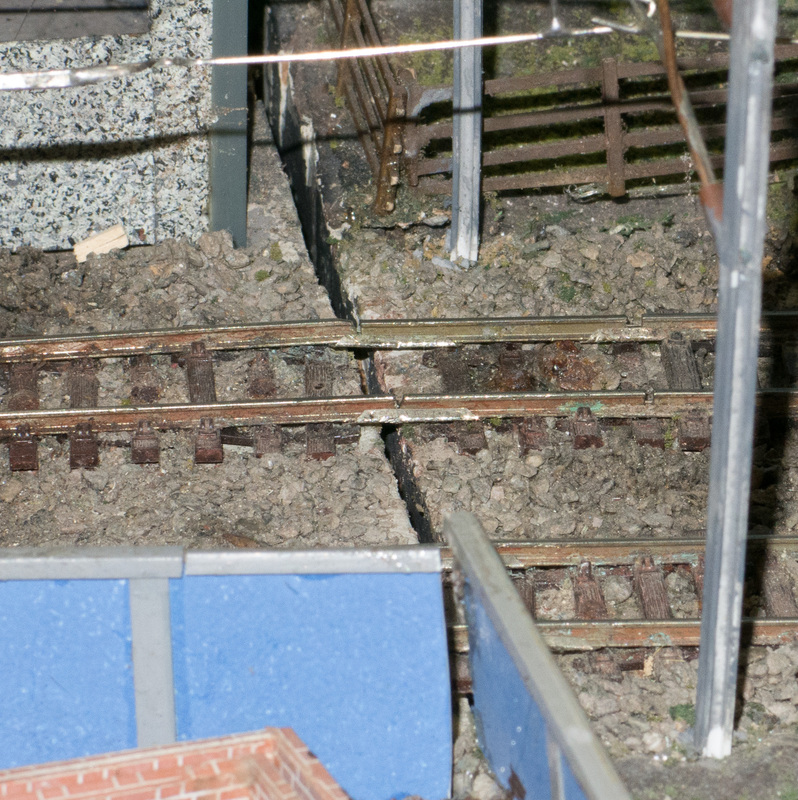 The layout is about 60% complete with ballasting being the next major undertaking. 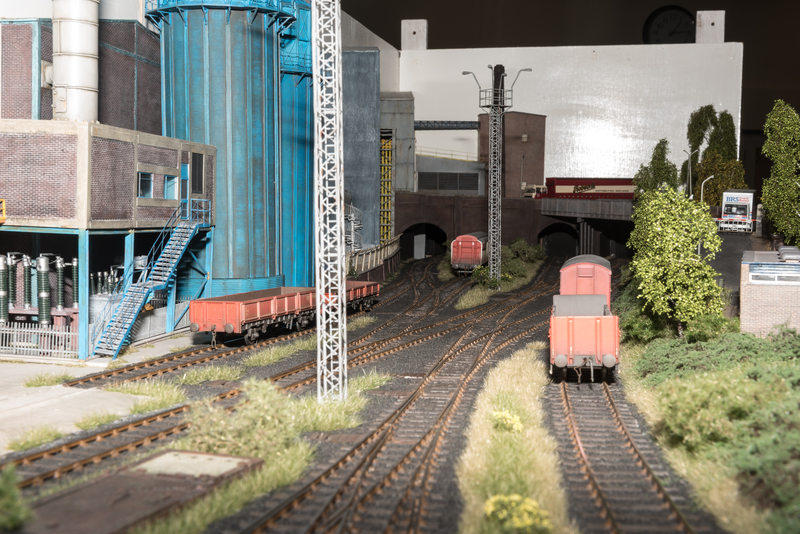 The purpose of the layout is to provide a platform to show stock movements, once some more stock is converted to P4. 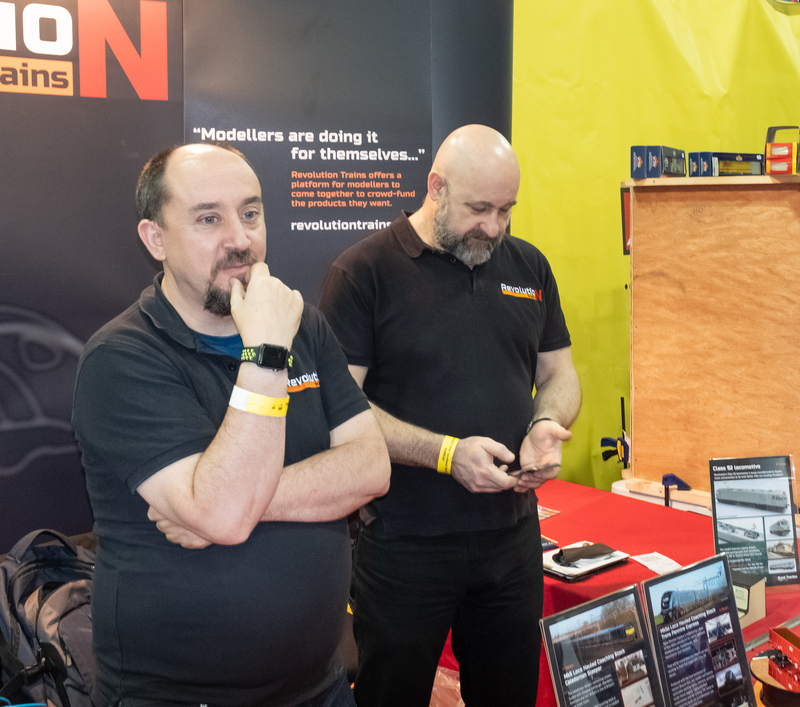 Well we hope this post fills a gap and shows that we do also manage to fit in some serious modelling whilst at the same time having a good laugh and a joke. 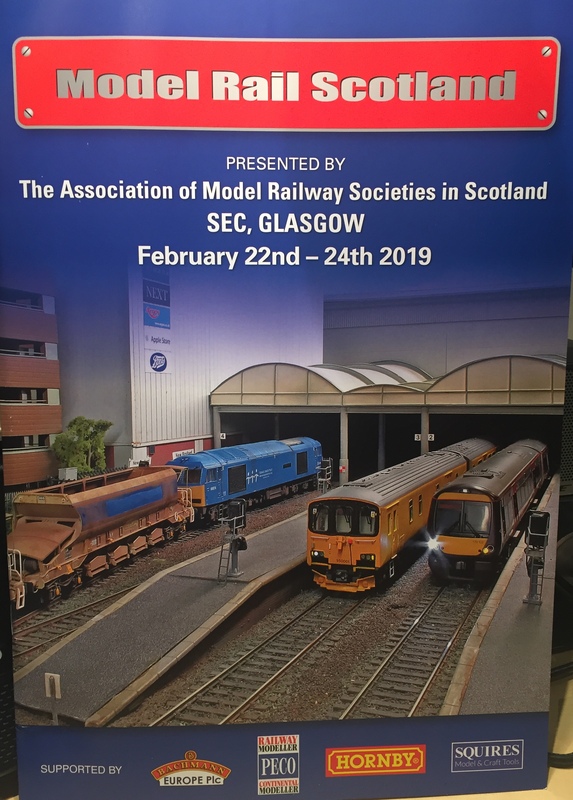 As previously reported, due to the success of the DEFine Modellers Day in January 2017, it was decided to hold the event again in 2018. 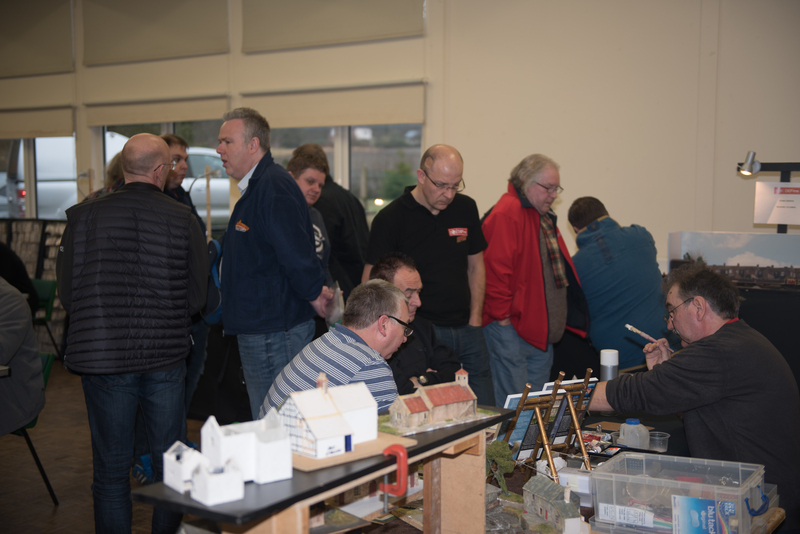 The format of the event had received a favourable response from those who attended the first Modellers Day so we stuck with a similar format. 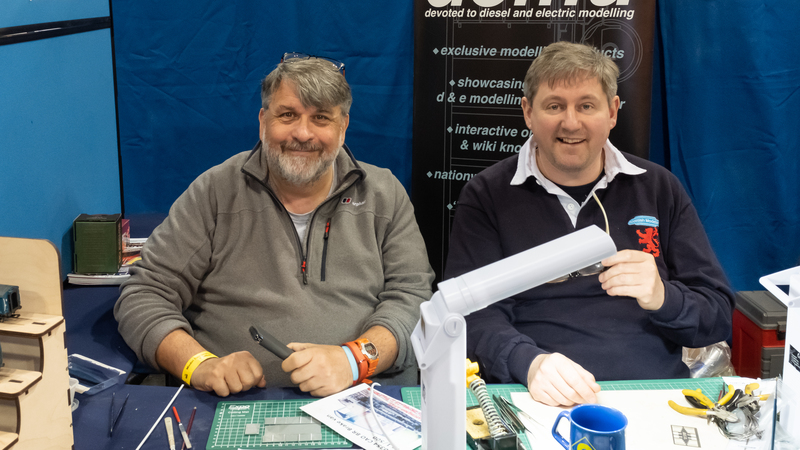 The idea of the DEFine Modellers day is to provide an event for serious modellers to get together in a social vein to display and demonstrate their handiwork and to share information with like minded souls. So with that in mind , how did we do this year? 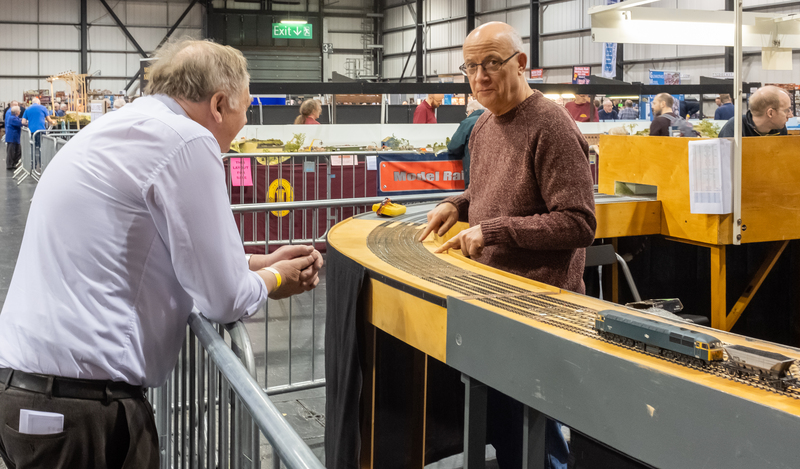 We once again managed to fill both halls with differing and interesting exhibits and demonstrations. 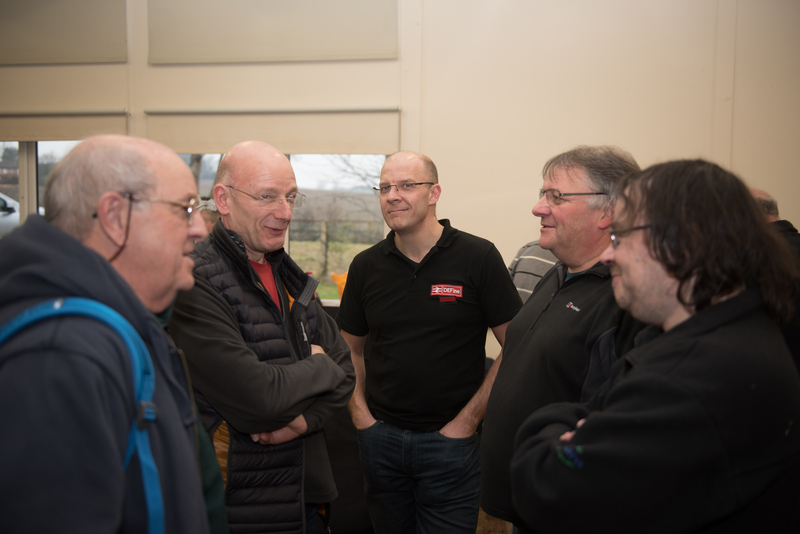 We are indebted to those who agree to come along and volunteer their time in order to make the event a success. 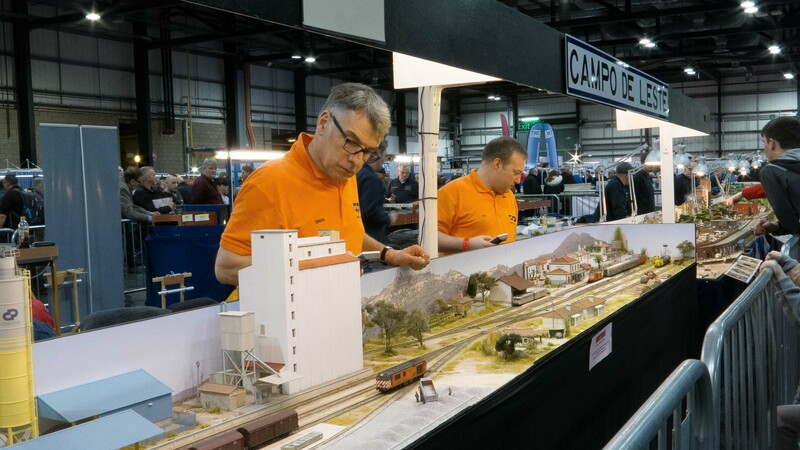 It is THE event run by serious modellers for other modellers irrespective of ability. 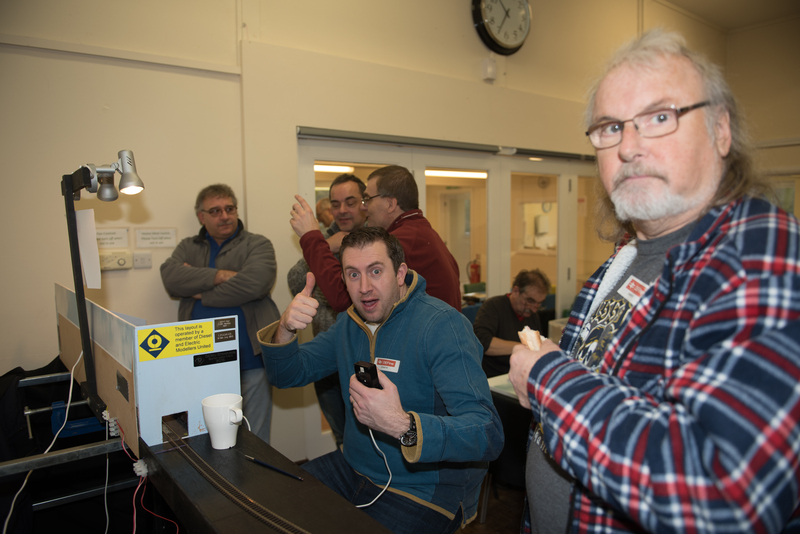 So it was at 7.15am on a very cold Saturday morning that Pete arrived to open the hall and get the heaters on and get the urn on the go. Pete was swiftly joined by Bill and set up started. 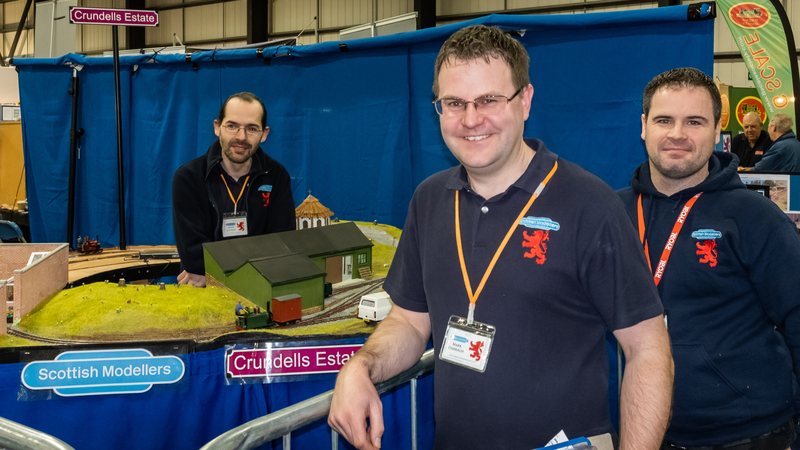 Paul and Dave arrived shortly afterwards with their excellent layouts “Splot” and “Underhill Road”. 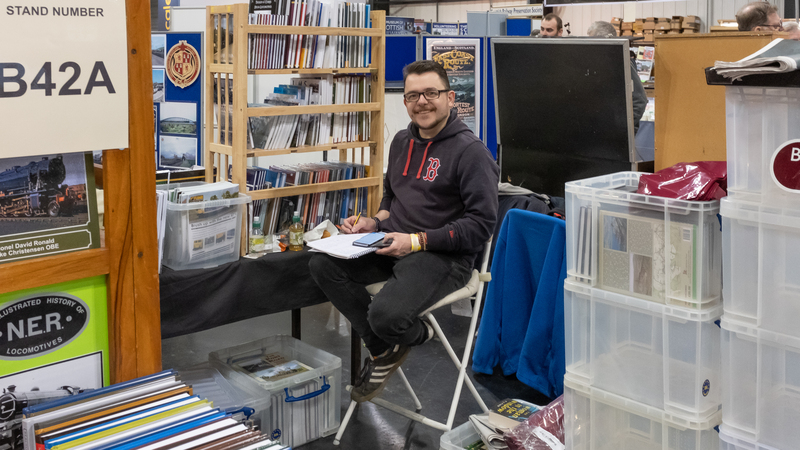 Whilst Dave and Paul commenced building their layouts up the others were laying out the floorplan of tables and chairs in anticipation of the other layouts and exhibitors arriving from 8am. 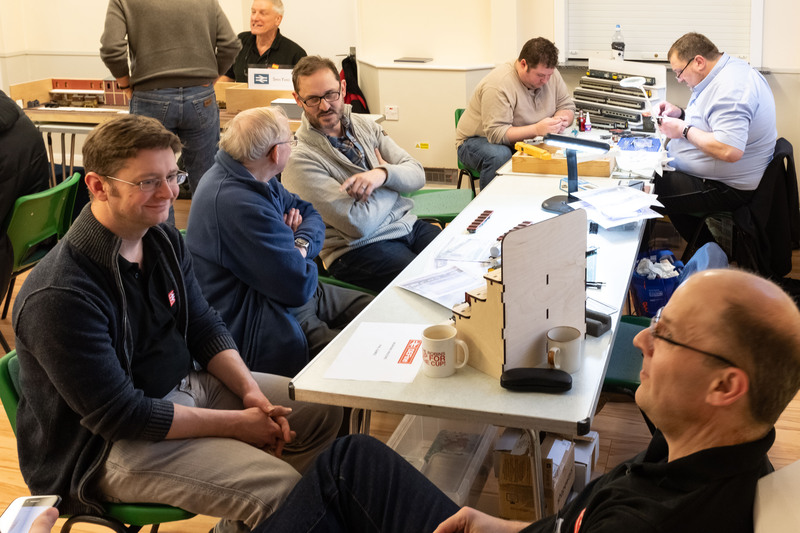 In no time a steady stream of bodies and boxes of all sizes started to fill the room and very quickly it started to look like the event was taking shape. 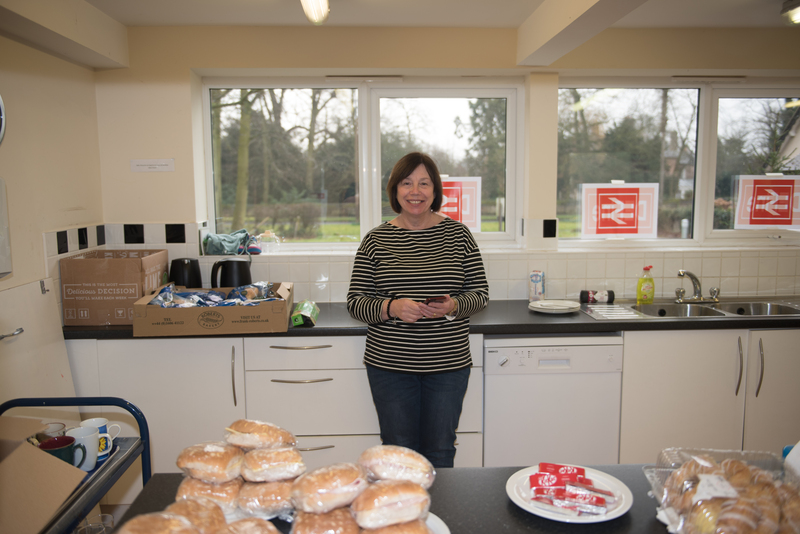 Next to arrive was Sylvia (MrsD) who was in charge of refreshments and she set about arranging the kitchen area and making up the delicious filled rolls. 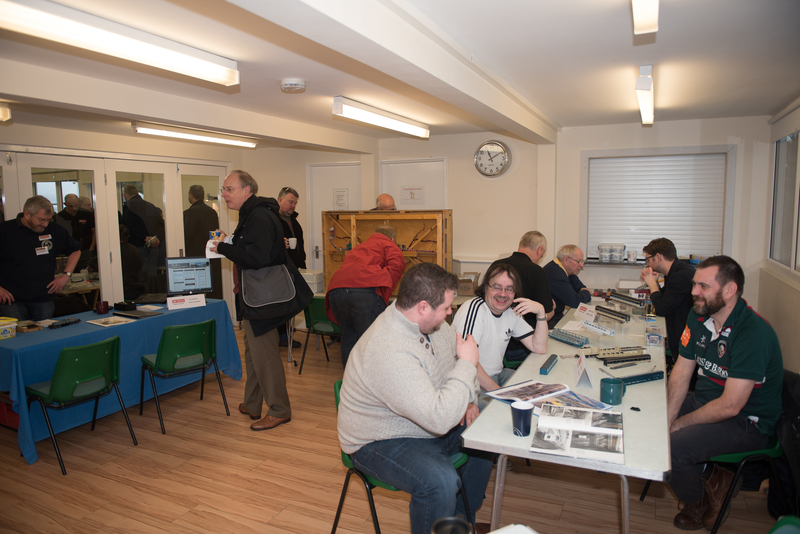 At 10am our first visitors were ticketed through the door and we were off and running. 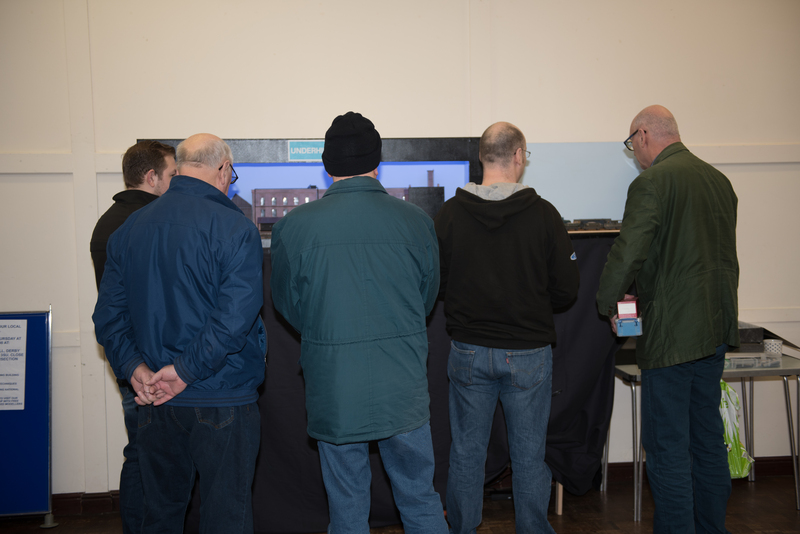 A steady stream of visitors then followed throughout the day. 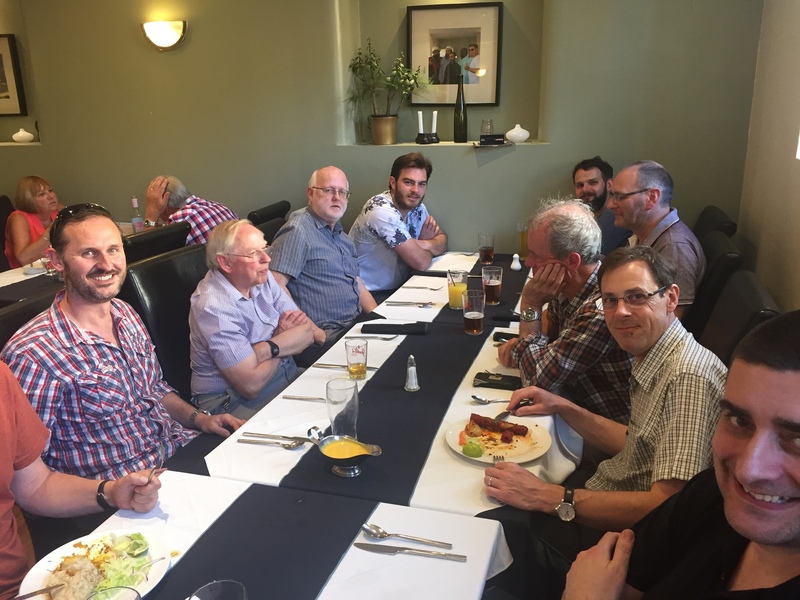 It was great to see so many friends and familiar faces, as well as some people who were attending for the first time. 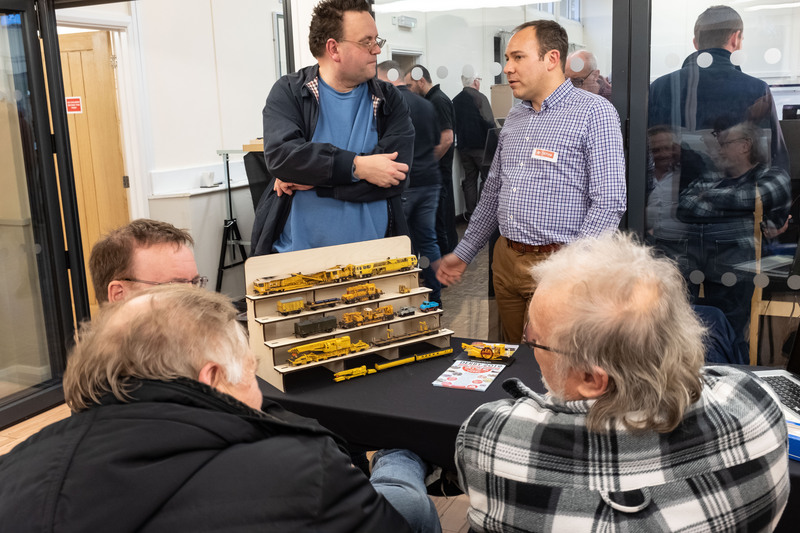 With all the DEFine members either demonstrating or showing layouts, and all the demonstrations having no empty seats in front of them the hall soon had a buzz that confirmed the event was going well. Some people stayed for many hours and chatted which is what we aimed for. 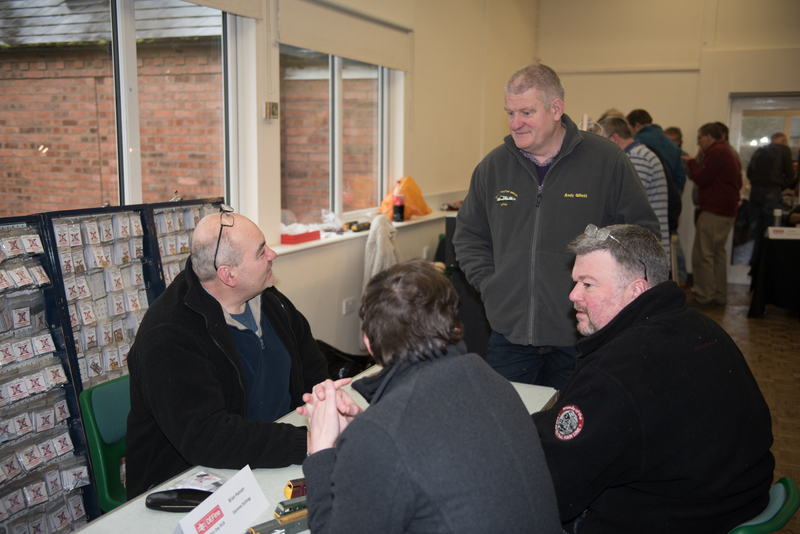 You cannot help but learn things or get enthused about something through talking to other people who are open and willing to share their expertise. 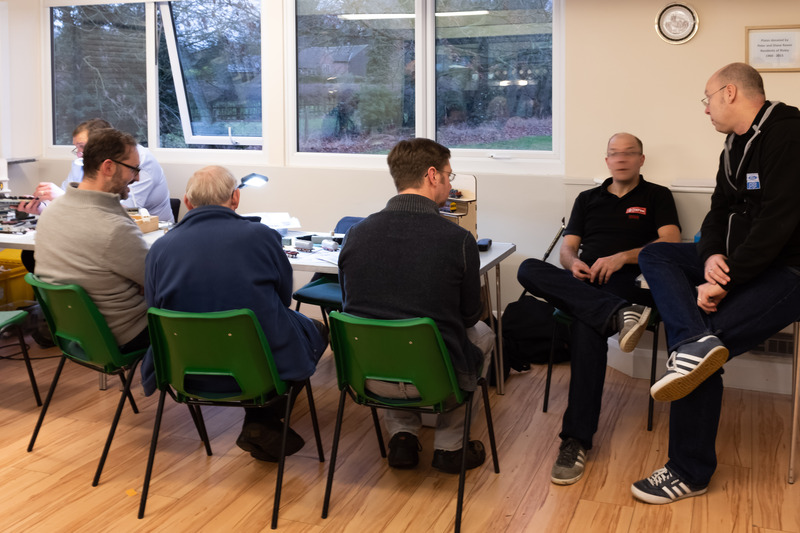 By 3pm we were almost out of refreshments but the tea and coffee were still flowing as people still congregated in the hall chatting. By 4pm closing the hall was still busy so we had to start clearing up around people! 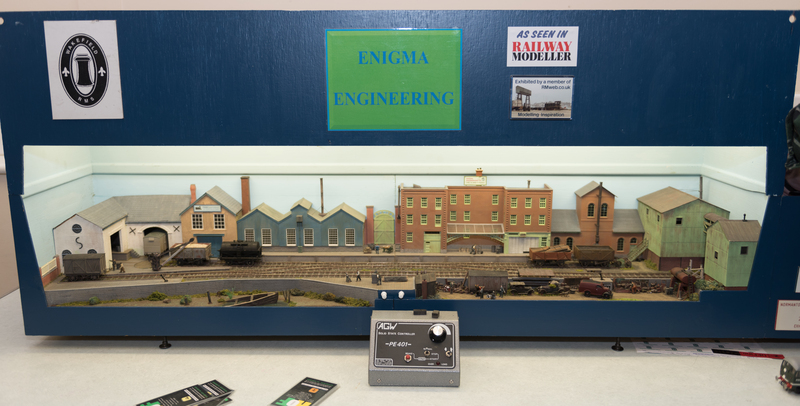 At one point we were going to have to ask the lads on “Enigma Engineering” to put the lights out when they left, as they were fully engrossed. 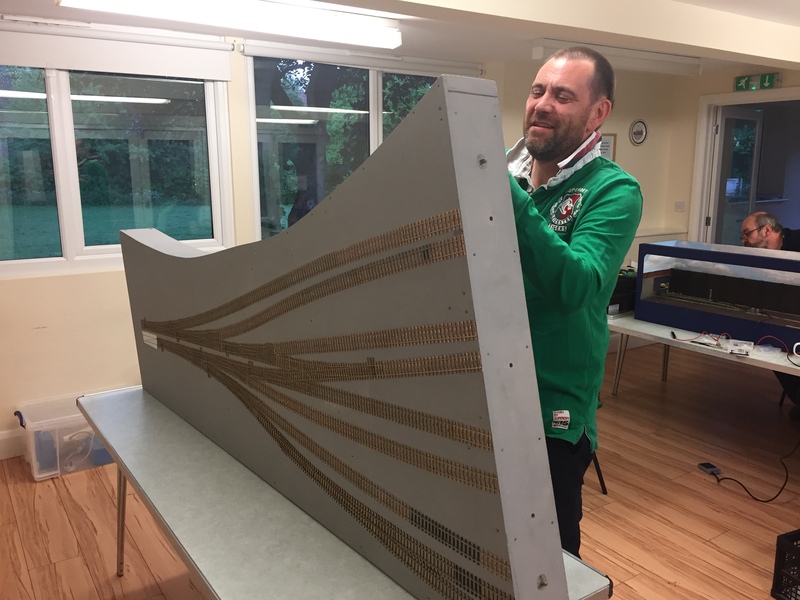 Having said all our goodbyes to friends and all those who helped make the event a success it was time to clean out the hall. Bill did a sterling job as Mrs Mop whilst Bertie took a truly systematic and methodical approach to sweeping the floor. Last thing to do was have a DEFine get together to analyse how things went. 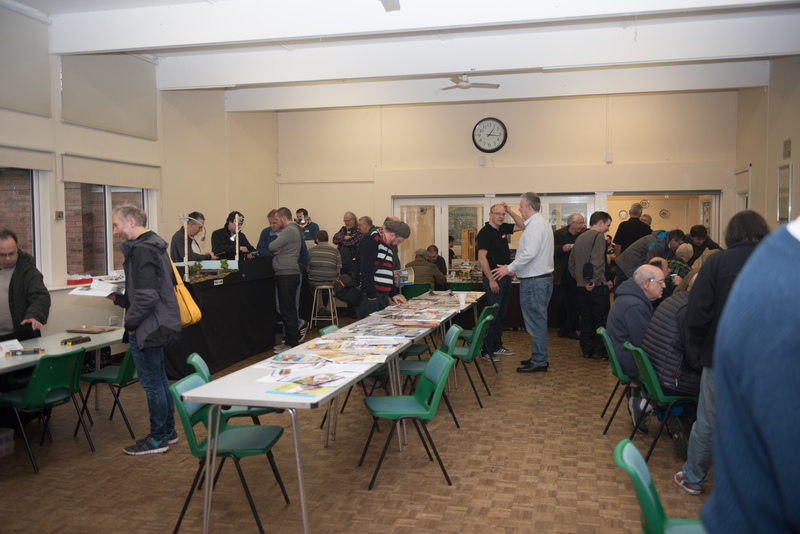 Our treasurer reported that we had almost the same number of visitors through the door as 2017 but taking everything into account we had made a £5 loss on the event. However that loss was immediately turned into a £7 profit by auctioning off the rolls, milk, crisps and cans to the group. We can therefore say the event was a financial as success!! With that done it was over the road to The Risley Inn for a celebratory beer. 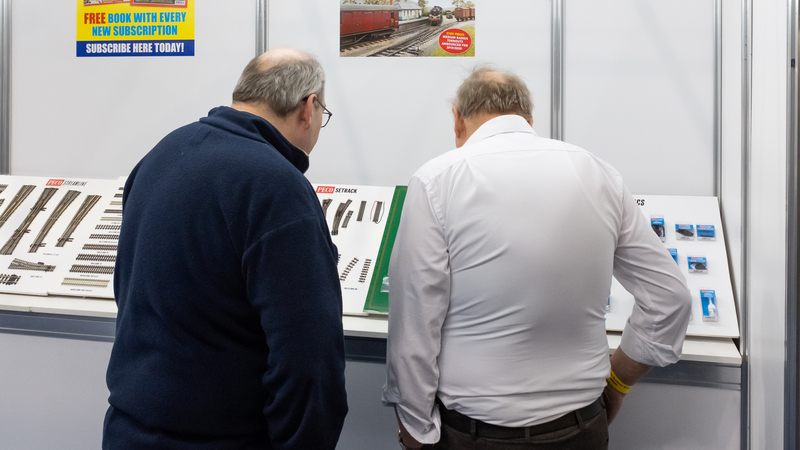 A big thank you from everyone in DEFine to all our visitors, exhibitors and demonstrators for making the event a real success. We got great feedback on the door as visitors were leaving. We will post up in due course what our plan is for 2019. 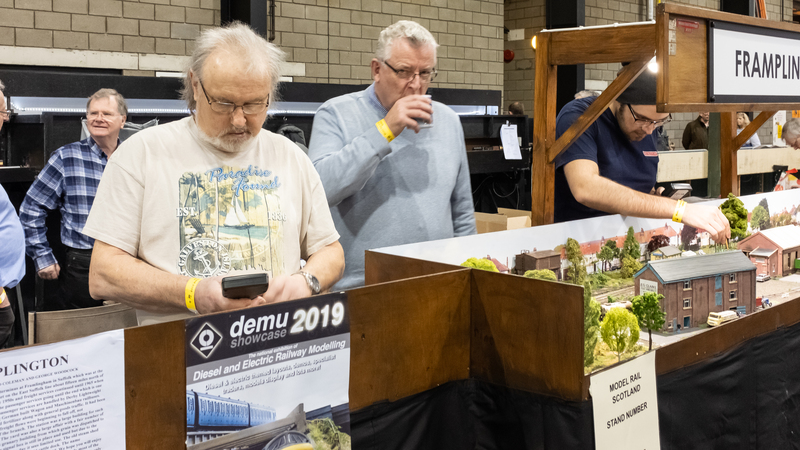 The challenge is for us to find new demos and small layouts for the event so we are on the look out now. We will close out with some pictures and captions from the event.